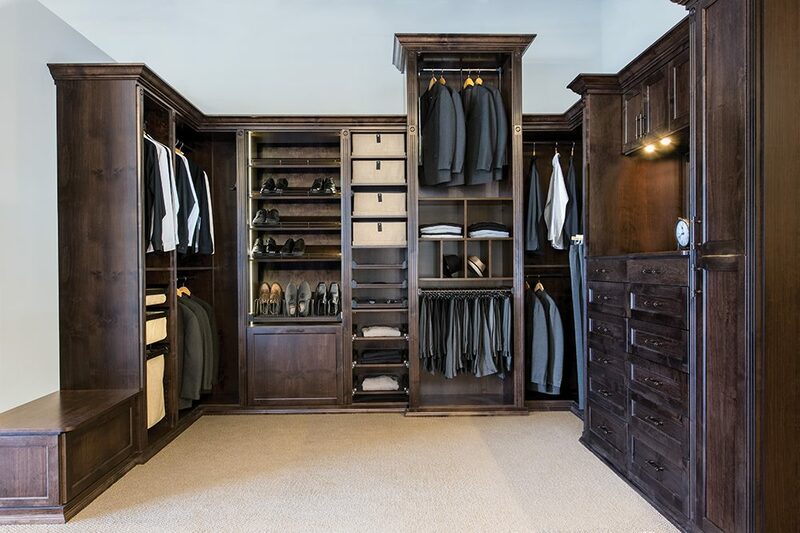 A recent survey revealed that 1 in 10 Americans say they feel depressed when they open their closet and 47% admit that they struggle daily to pick an outfit. 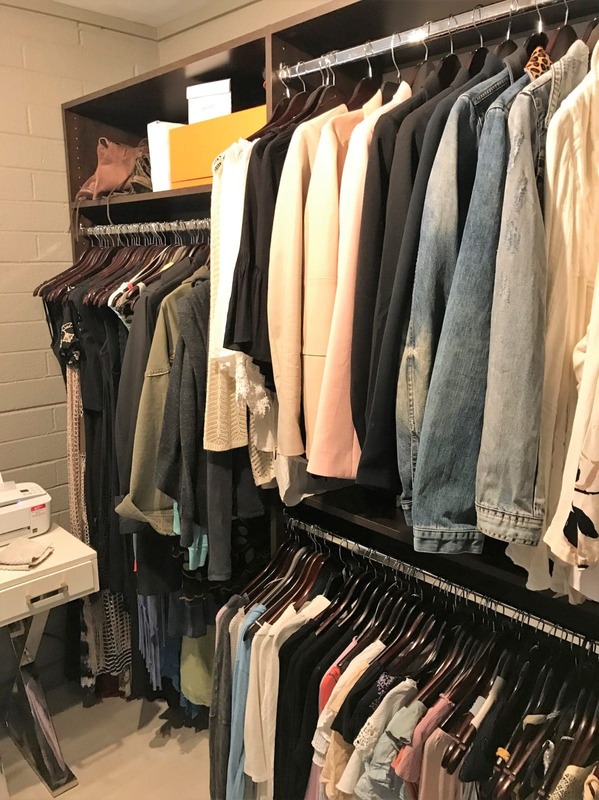 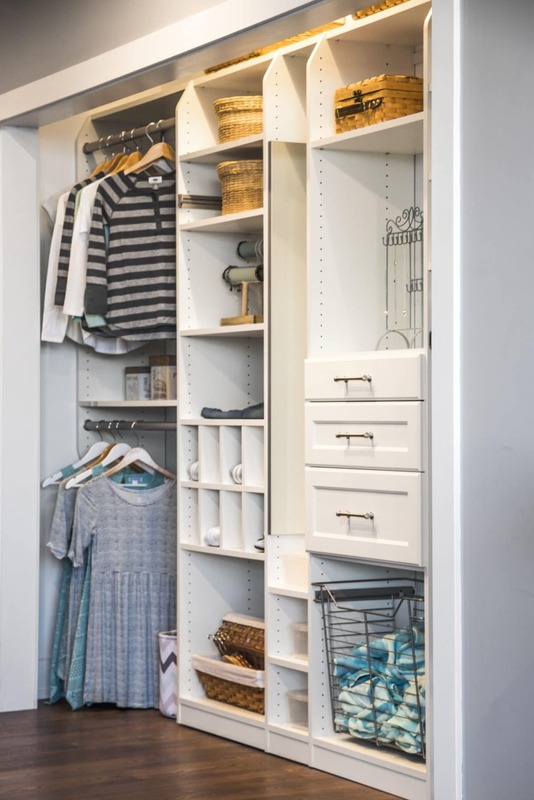 25% confess that their clothes storage space is completely disorganized and, when faced with the daunting task of digging through the mess, more than 60% will instead buy new clothes. 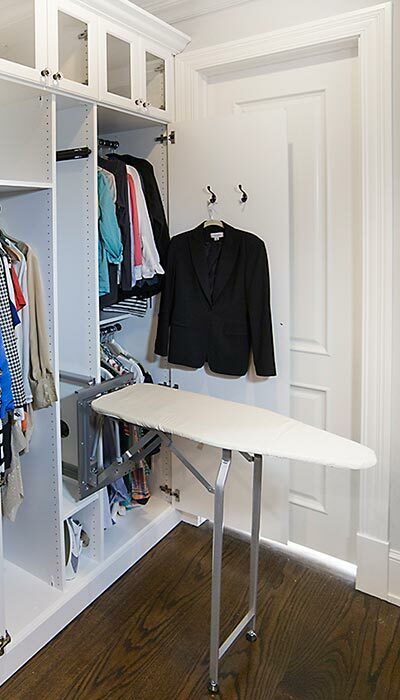 1 in 6 will even resort to sneaking an item out of the laundry basket! 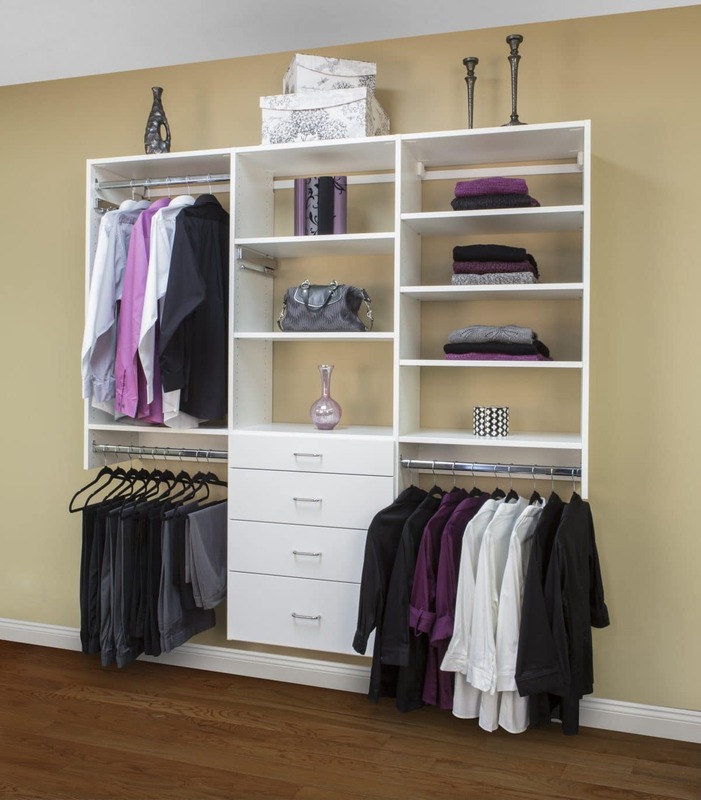 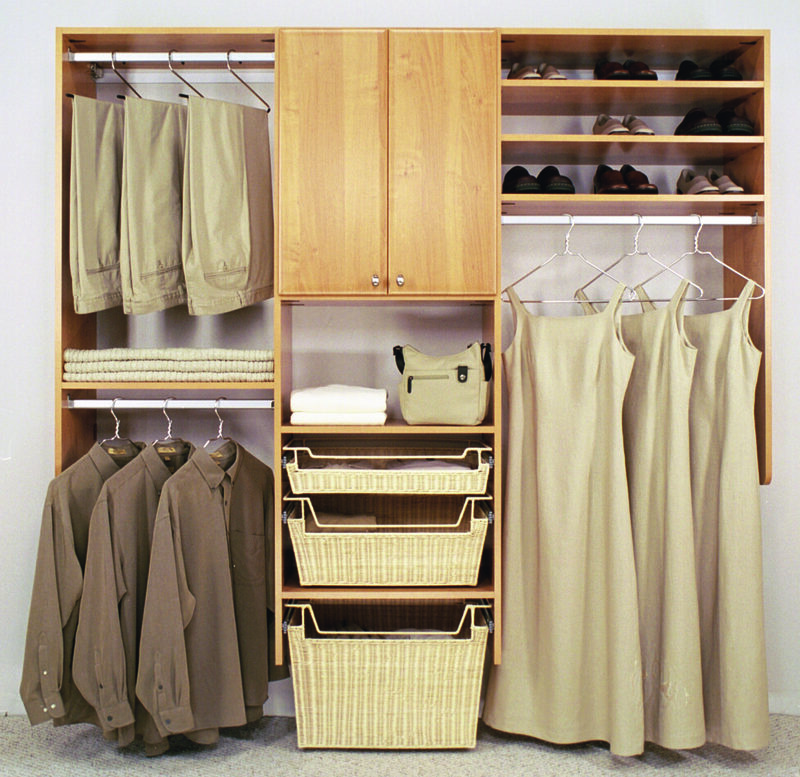 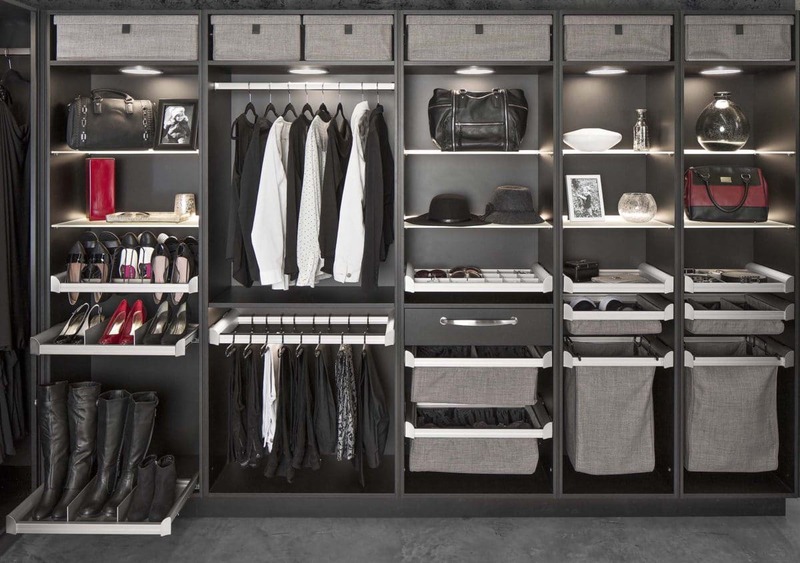 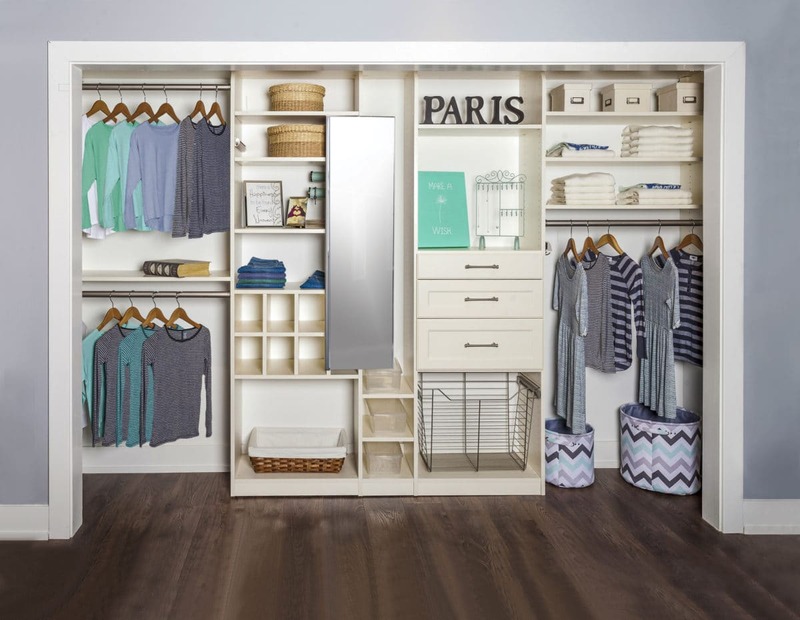 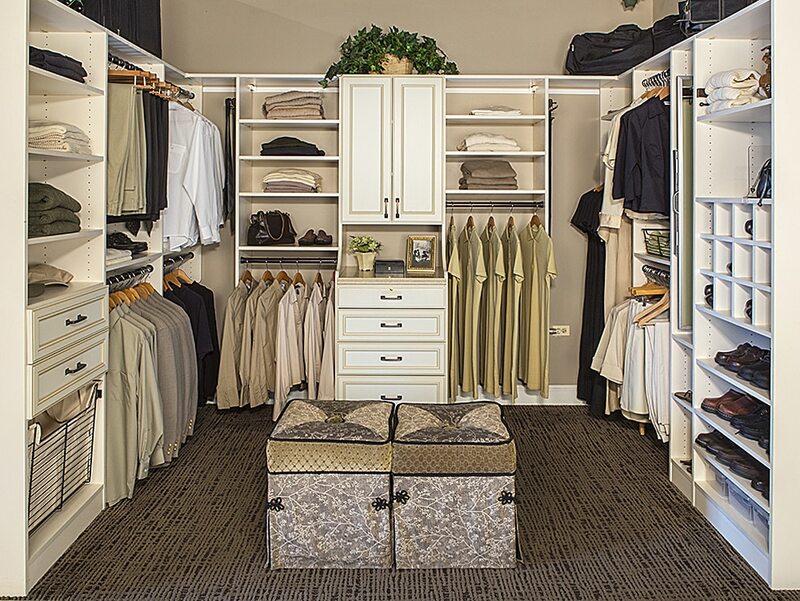 Organized Closets Designed to Last a Lifetime! 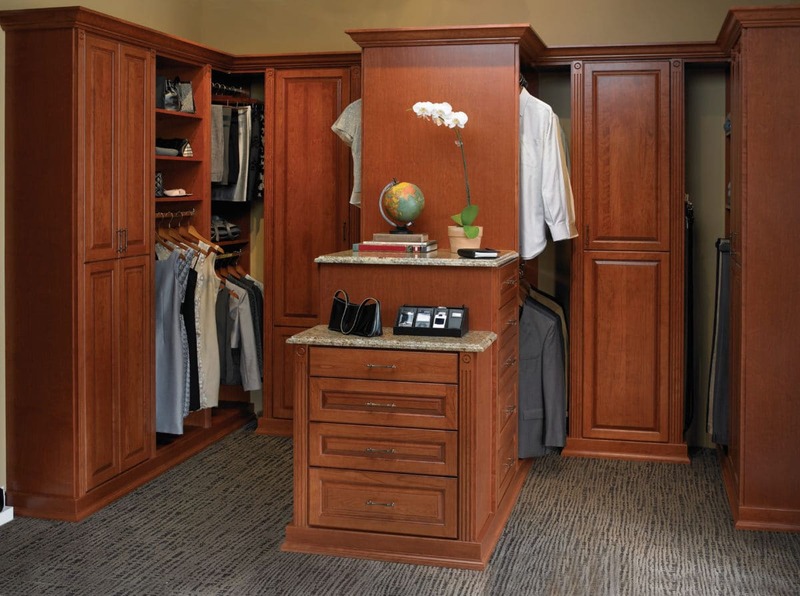 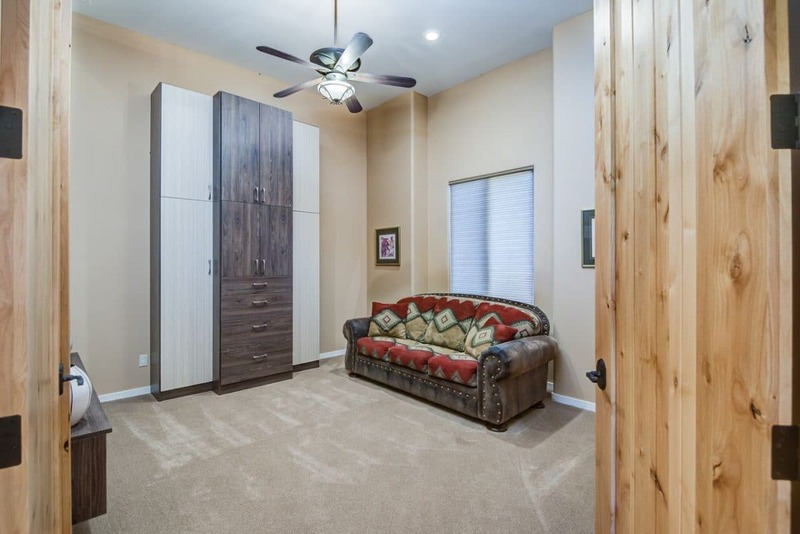 Our closet designs are custom tailored to fit in your space. 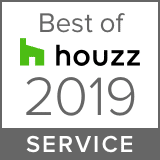 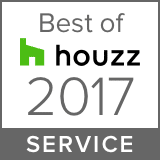 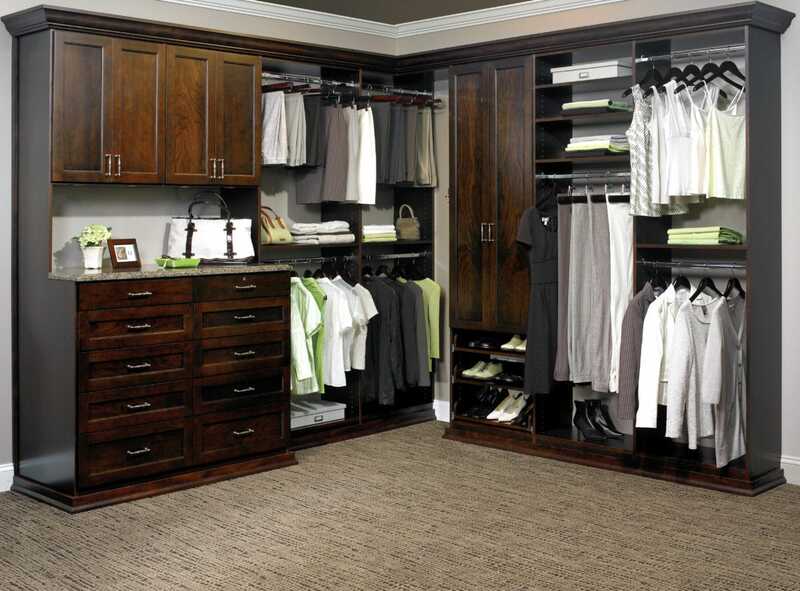 We start with a free, in-home design consultation. 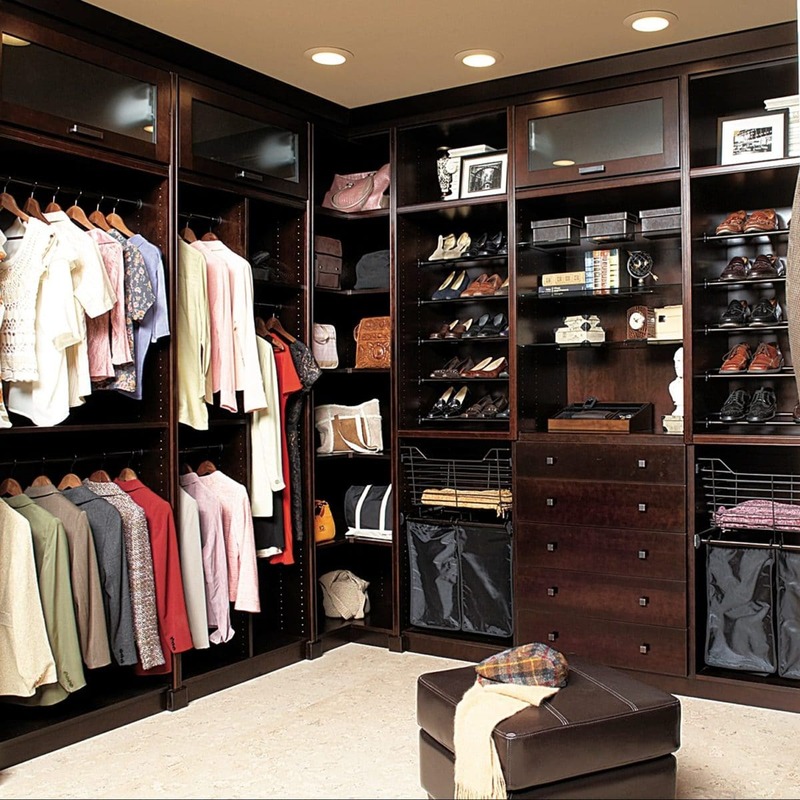 We listen to your wishes, your desires and your struggles. 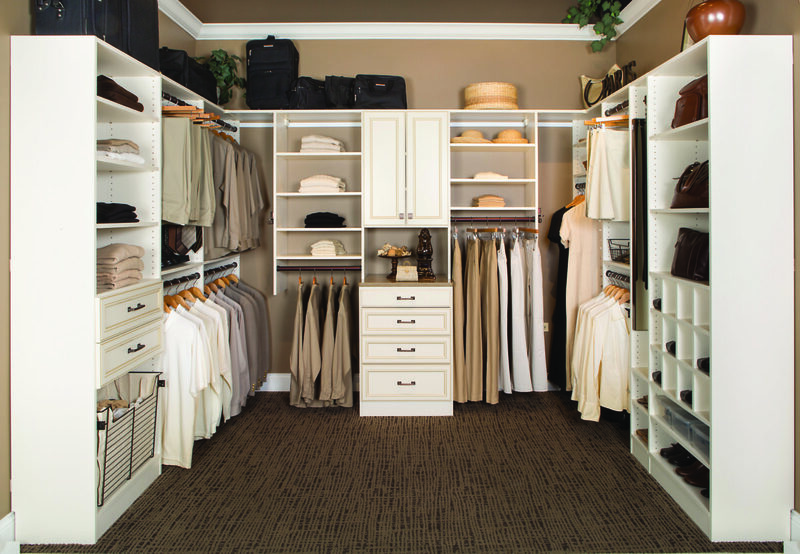 You get to browse through our color samples, our door styles and pick out hardware and closet accessories. 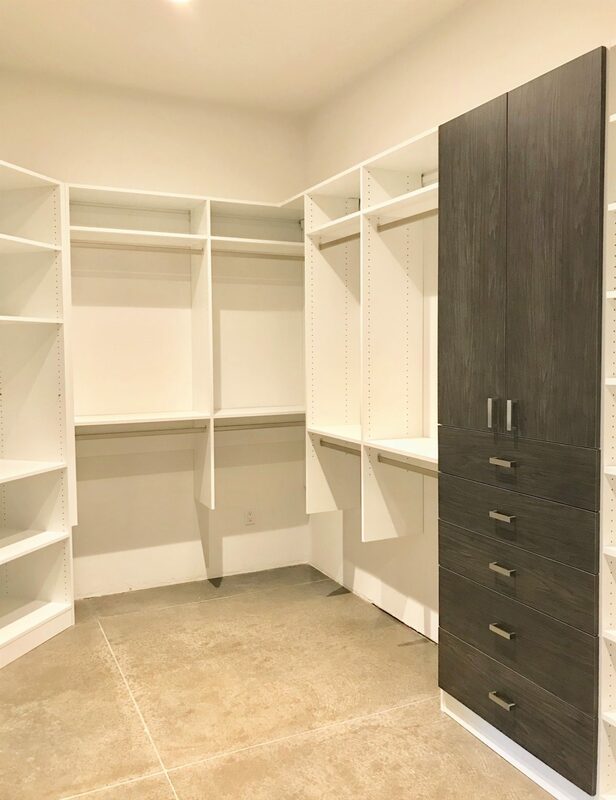 We take exact measurements, and our master closet designer makes recommendations that will maximize your storage space and save you money. 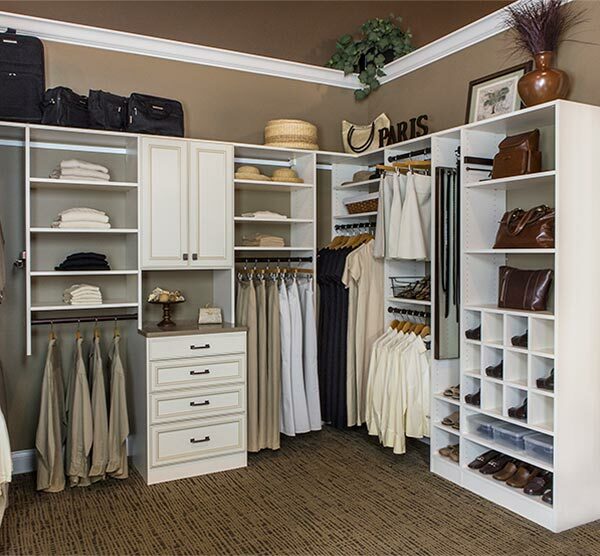 Whether you have a modest budget or a large budget, we want your dream closet to become a reality as much as you do. 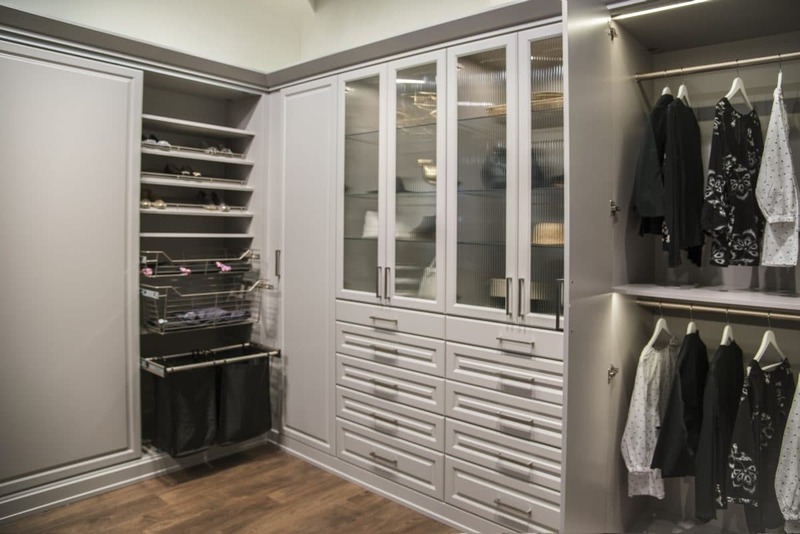 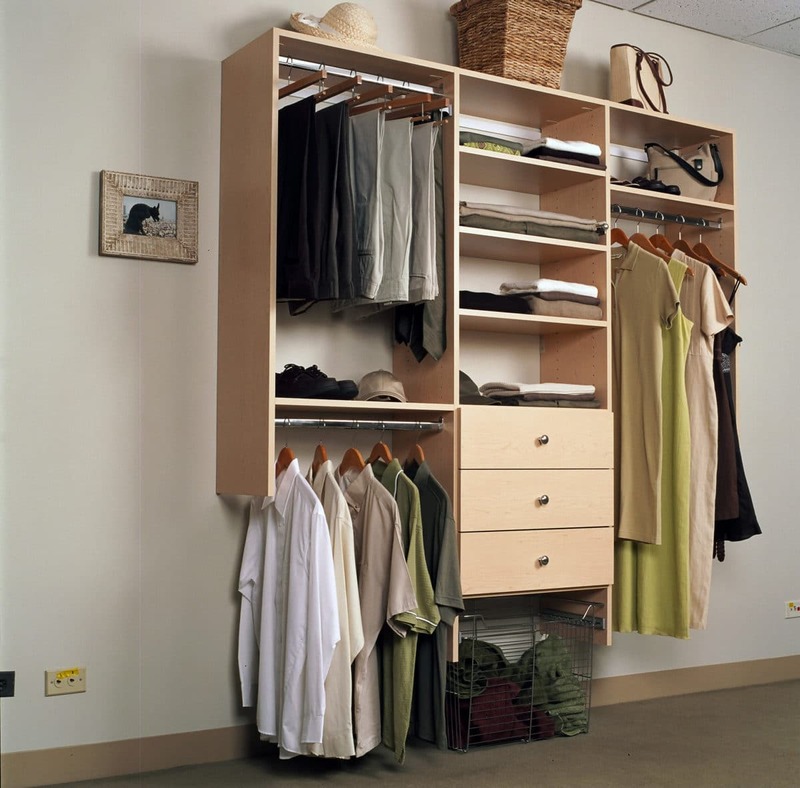 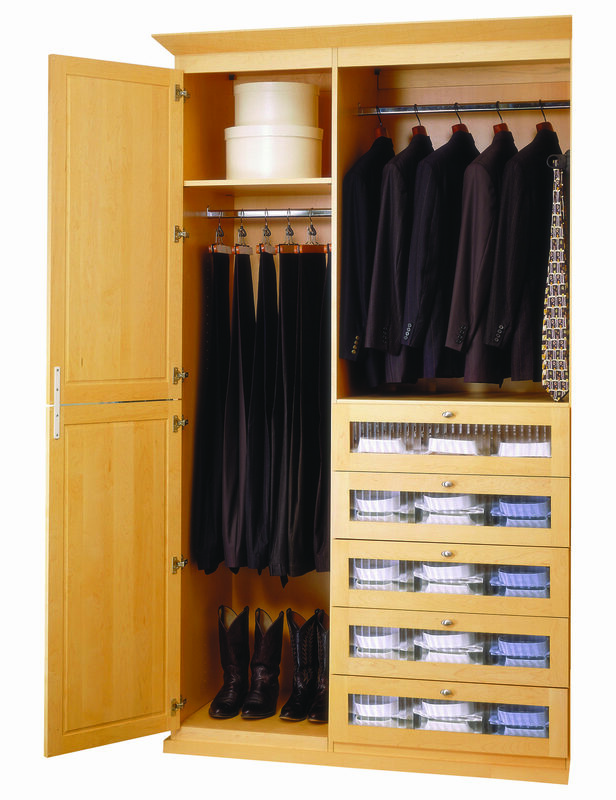 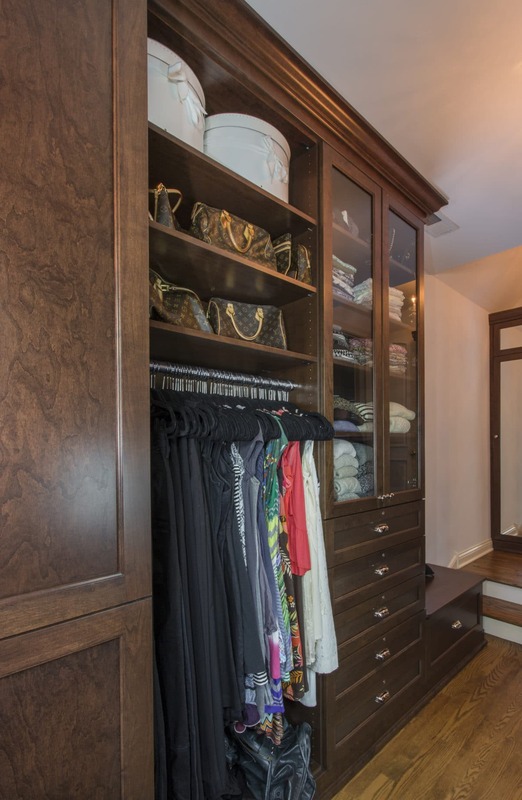 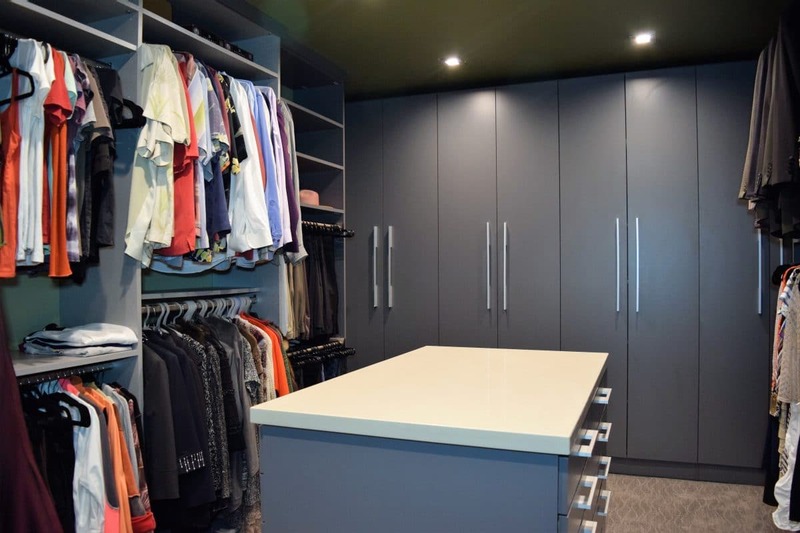 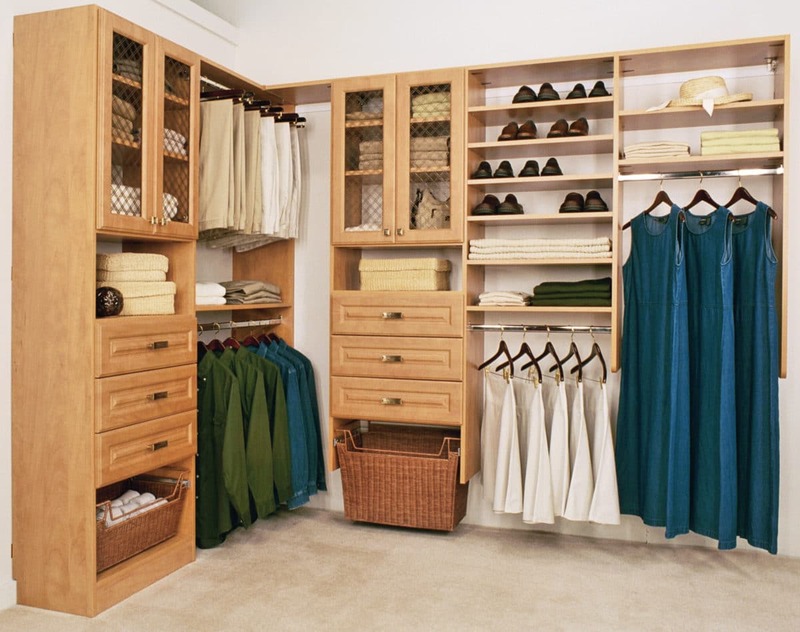 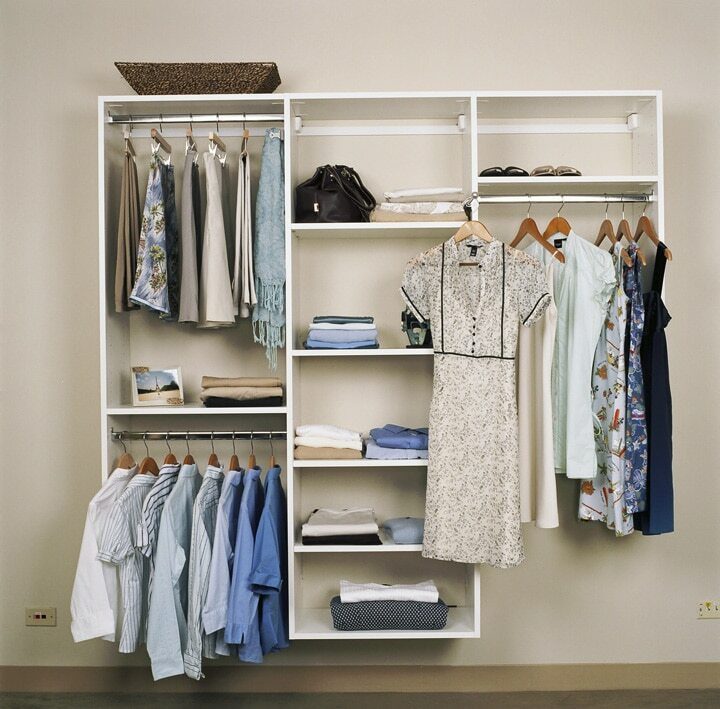 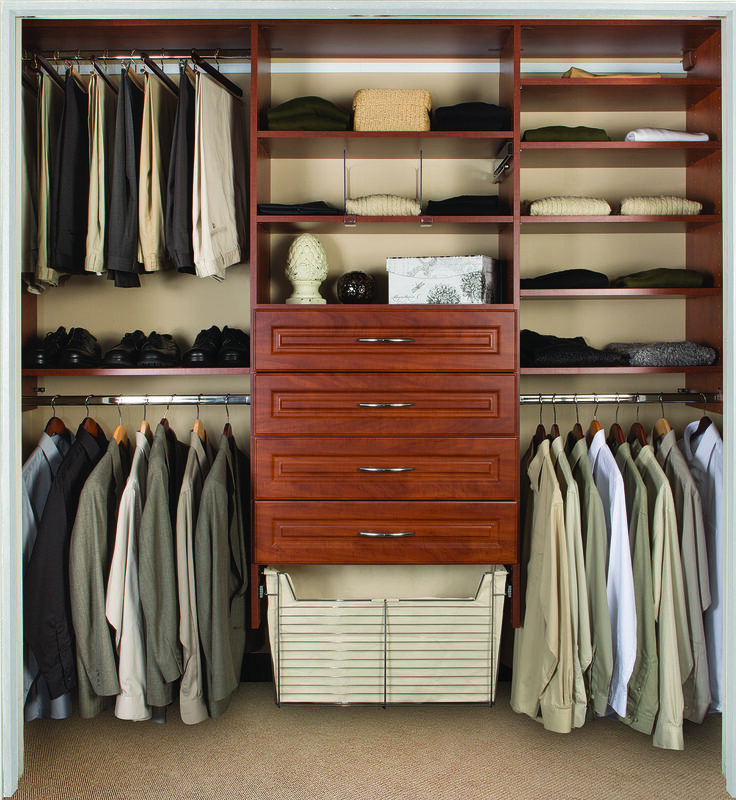 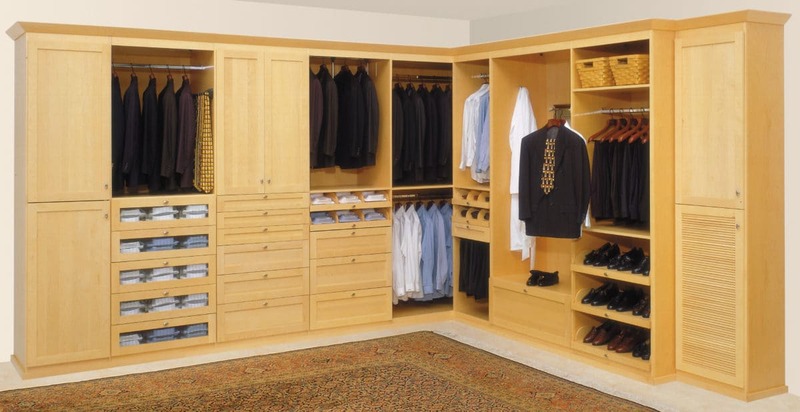 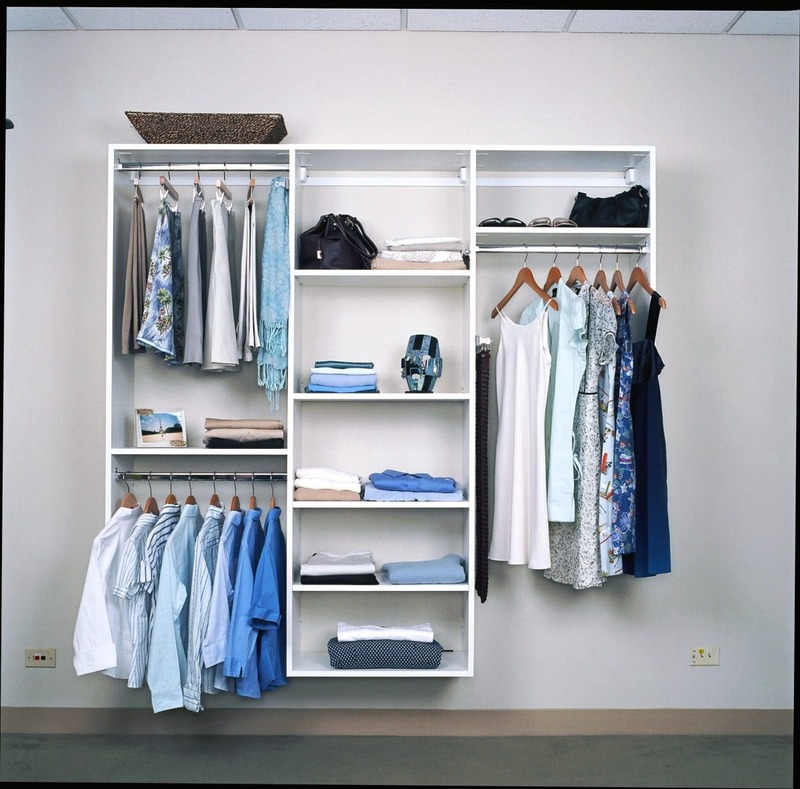 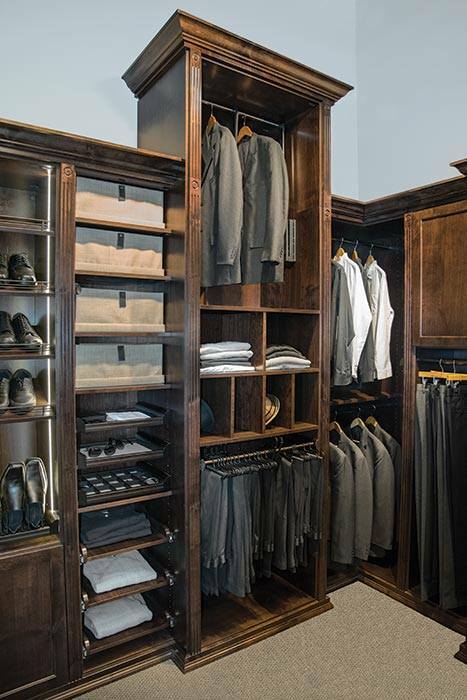 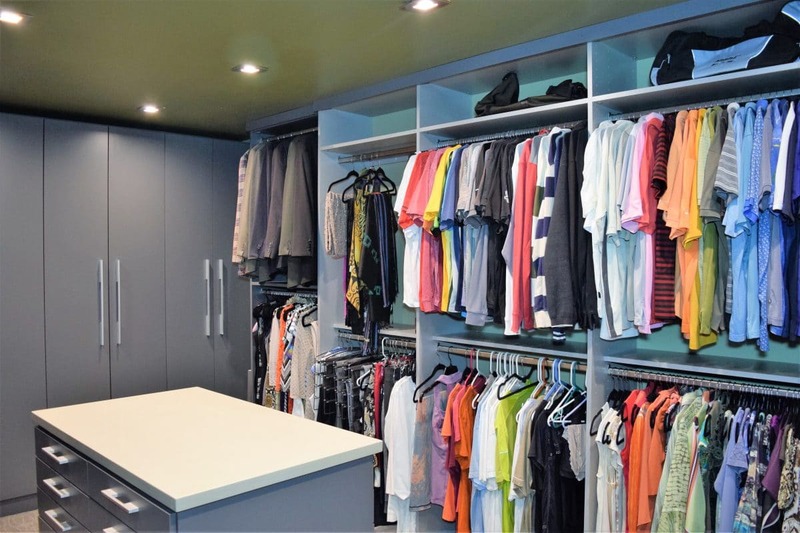 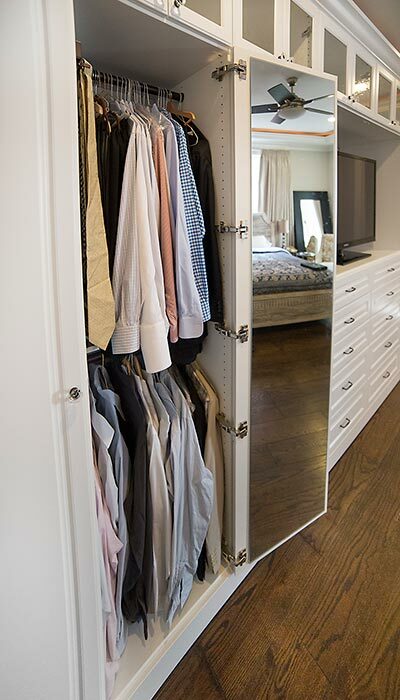 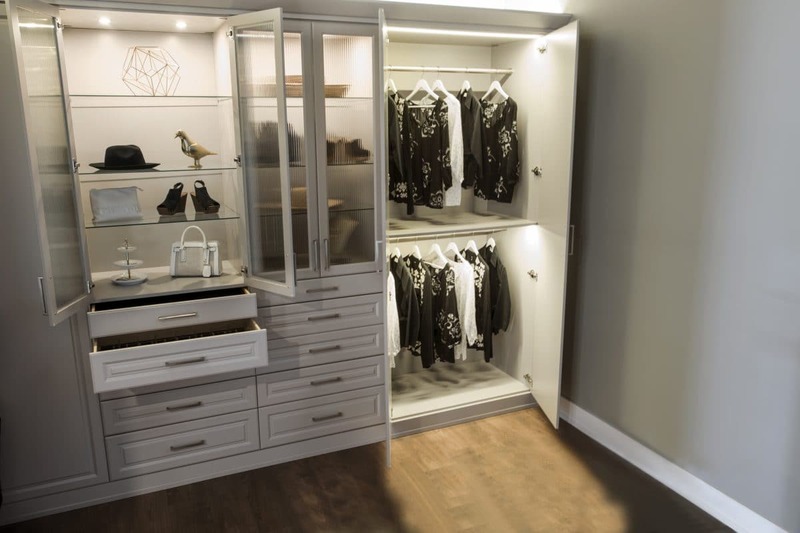 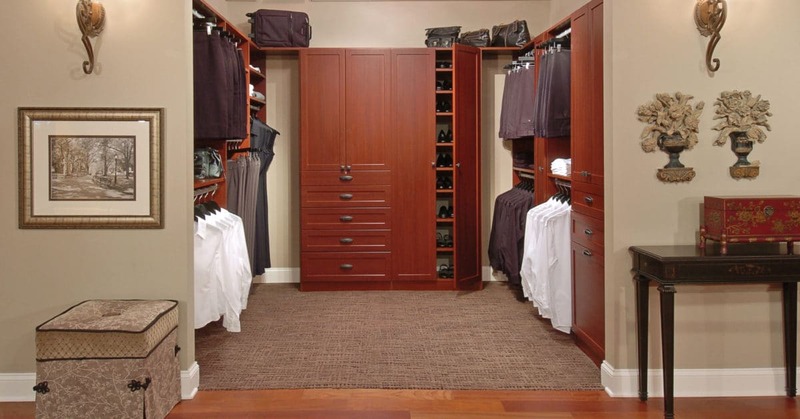 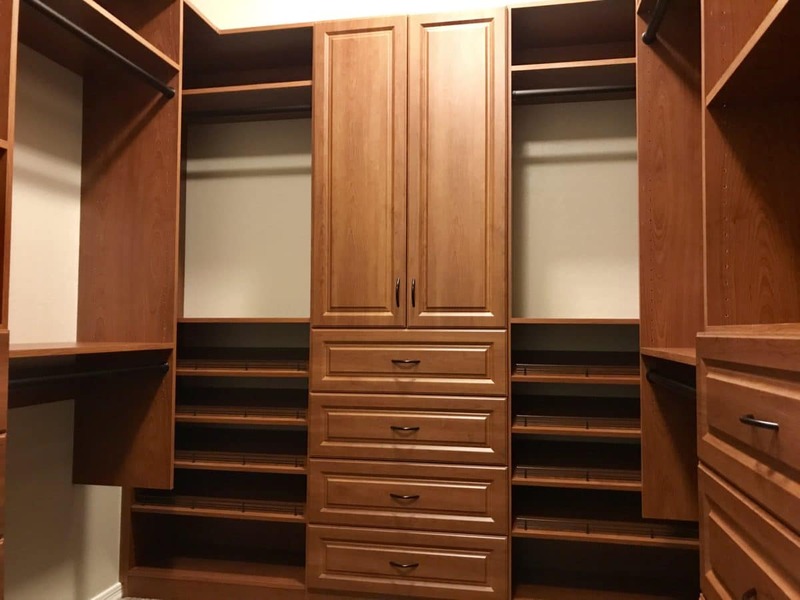 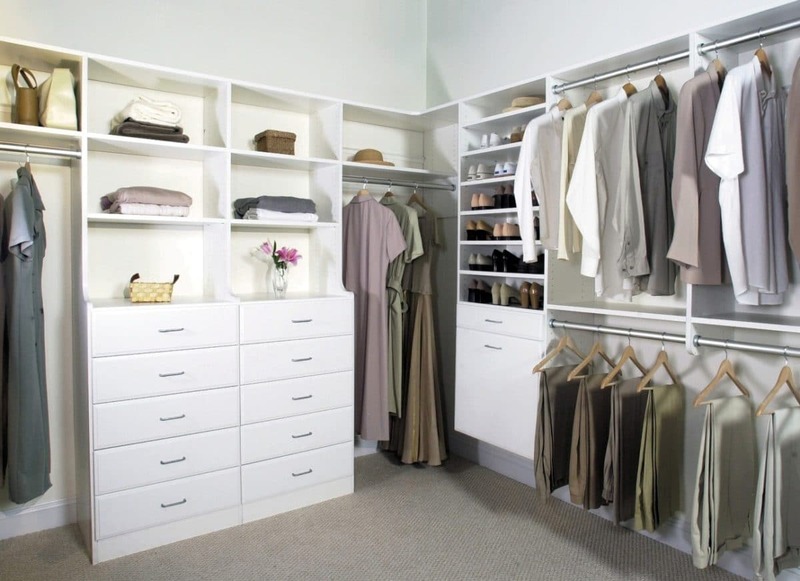 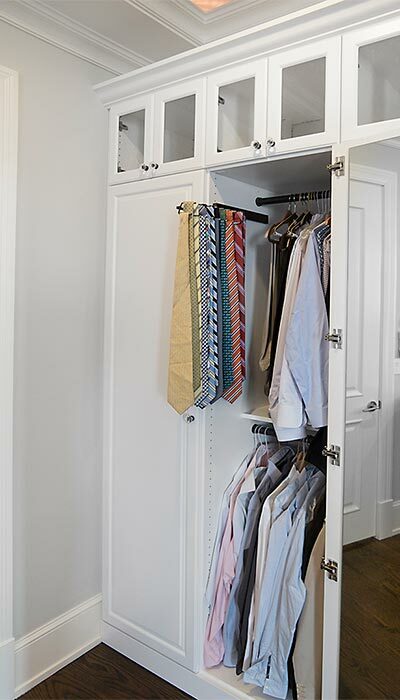 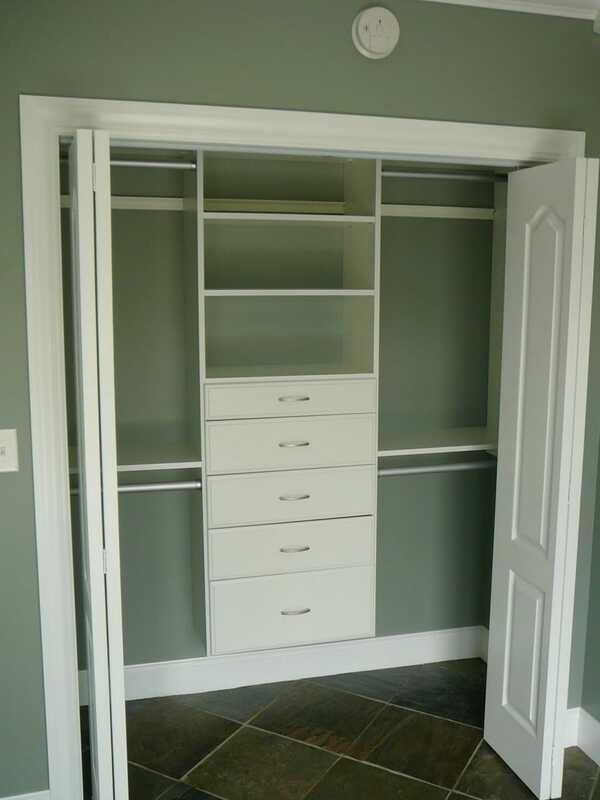 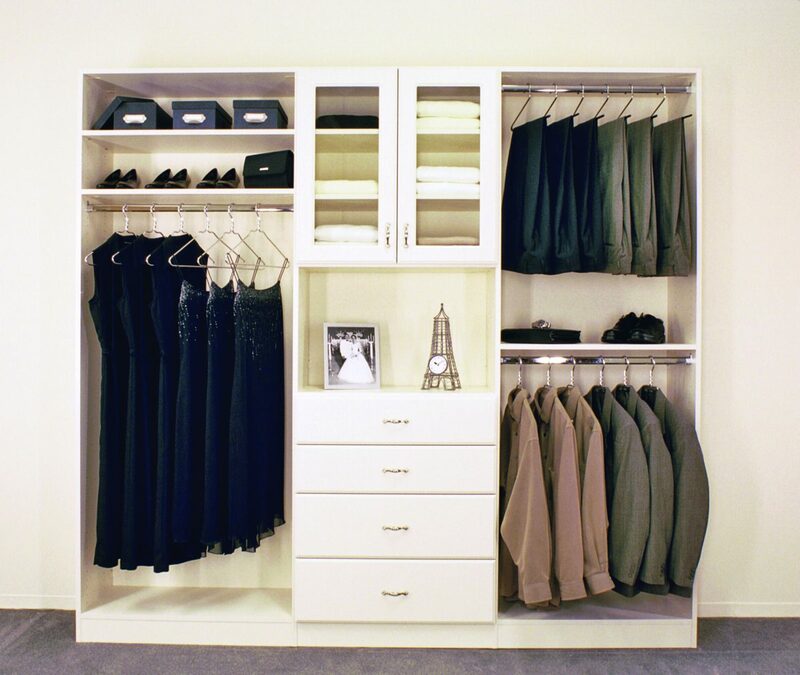 A built-in custom closet system can even add to the value of your home! 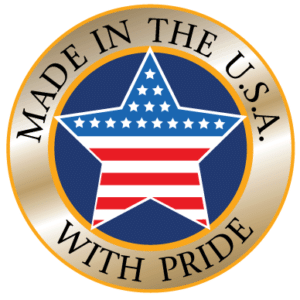 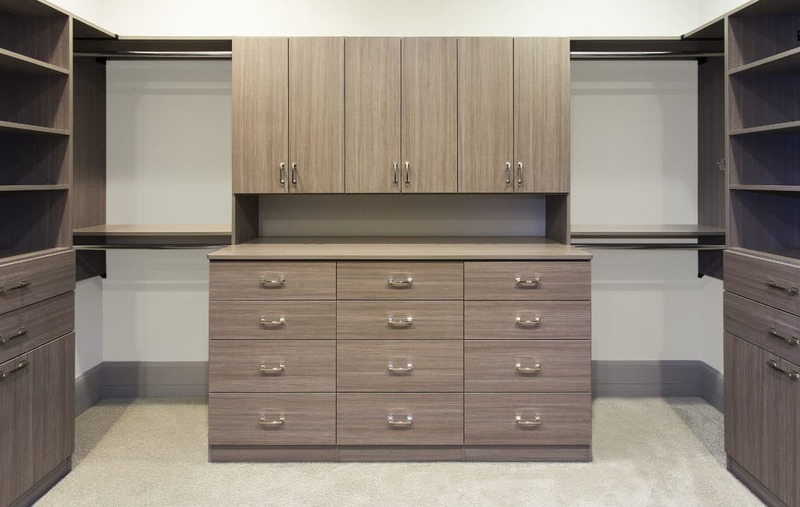 All of our materials are commercial grade and constructed of furniture-quality components designed to give you a lifetime of organization. 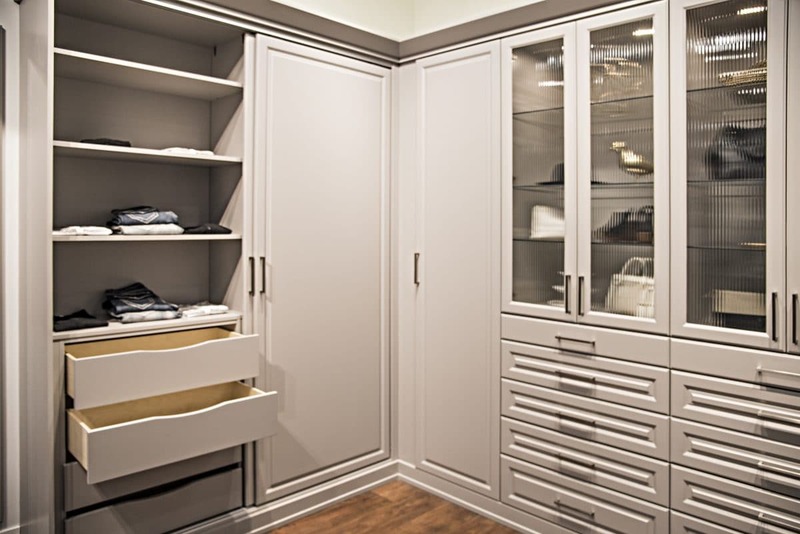 Our custom built-in closet systems are available as a floor based closet system, a suspended closet system or a combination of both. 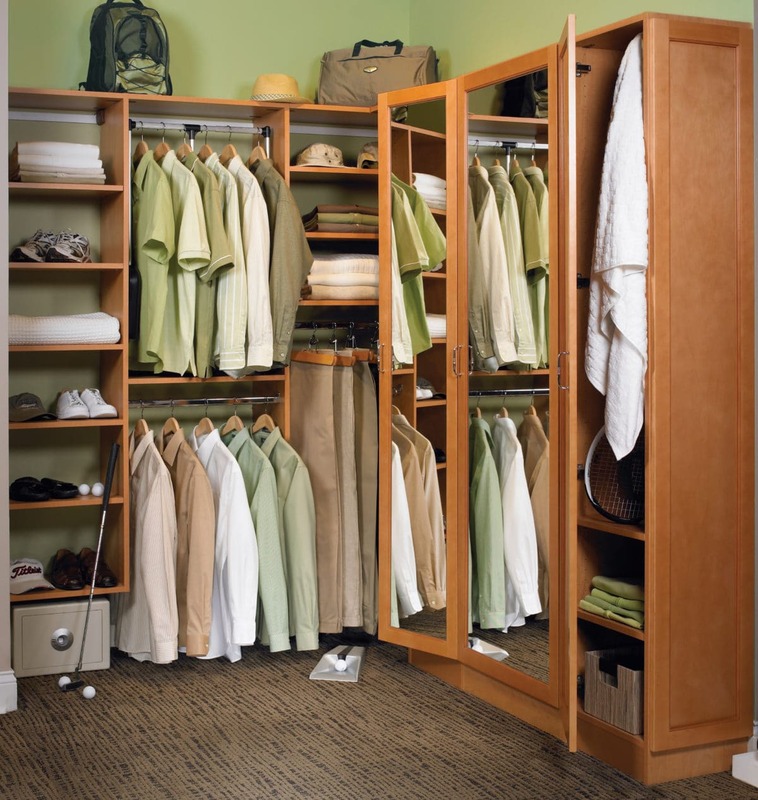 Whatever you wish for your closet, we can accommodate your storage and organization needs. 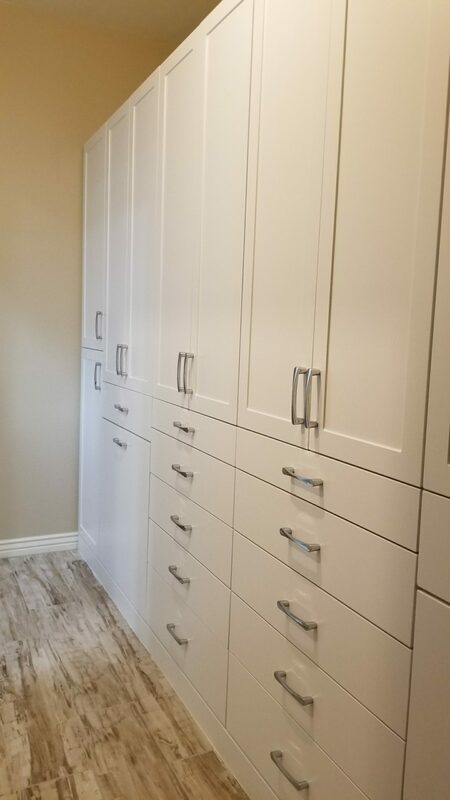 With over 30 years of design and construction experience, we will ensure that the process is efficient and hassle free. 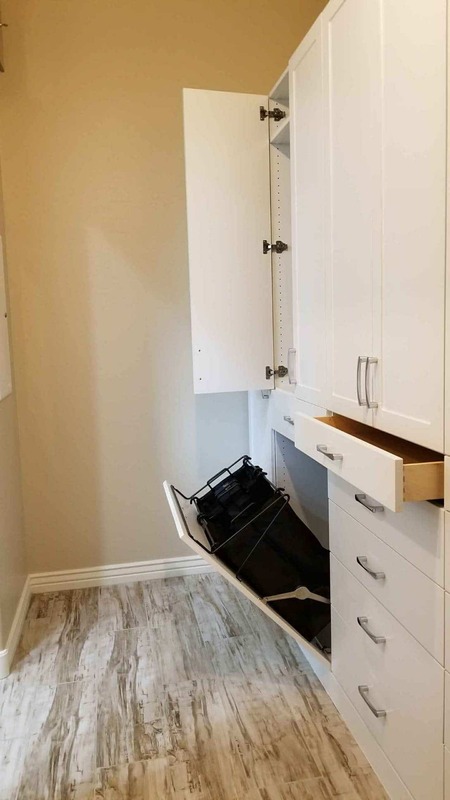 Don’t take on that DIY project. 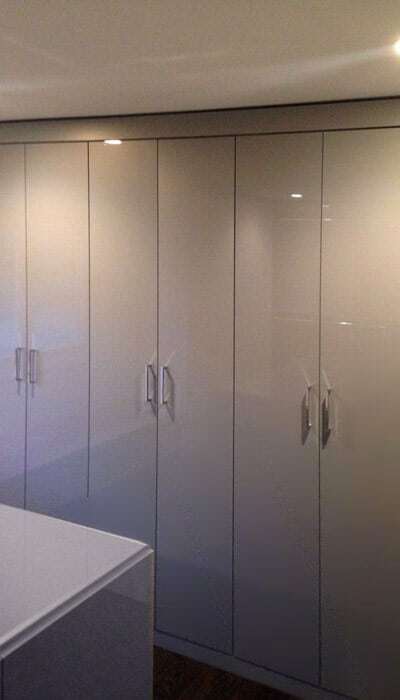 It never turns out the way you imagine. 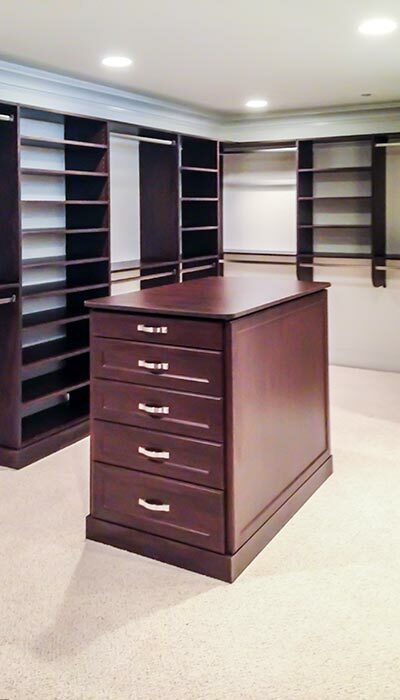 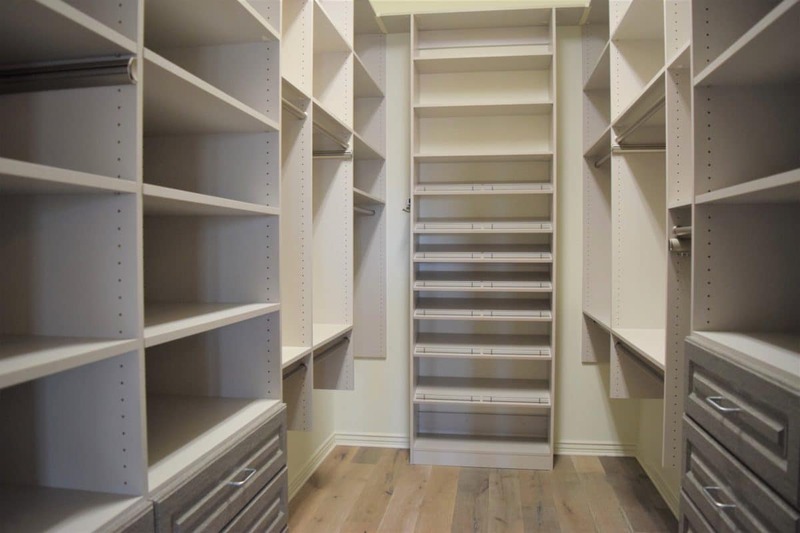 Let the Austin-Morgan Closets professionals build your dream closet today. 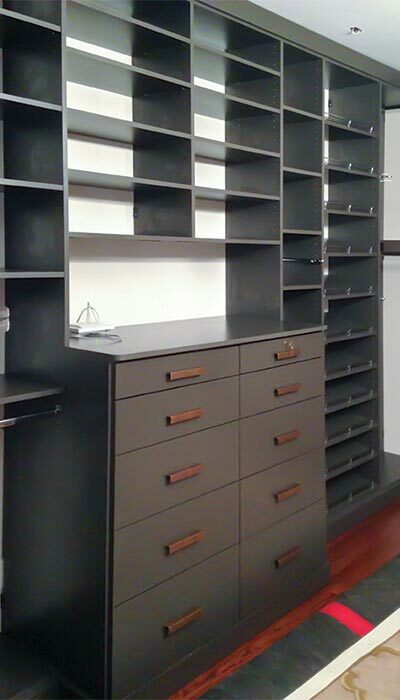 Check out our gallery below or download our catalog for further inspiration. 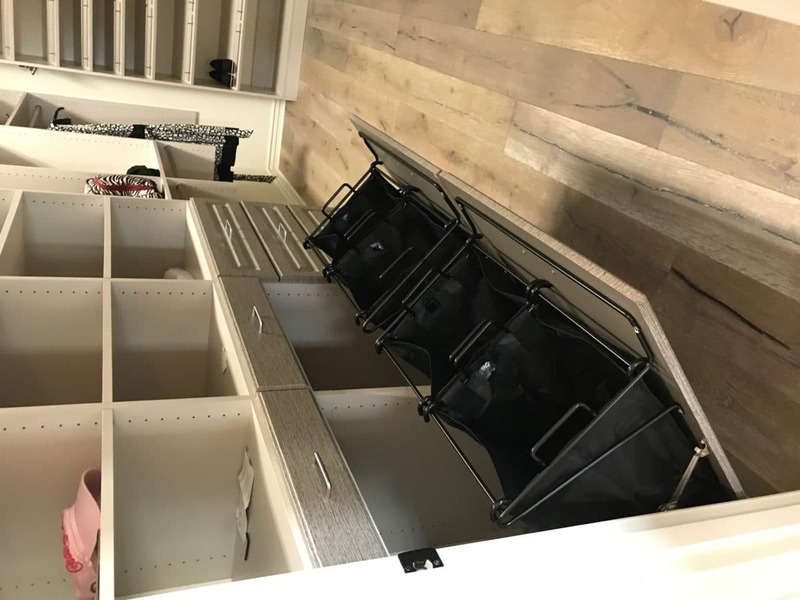 Based on a metal rail that is secured to the studs, this system is very popular for suspended closet projects. 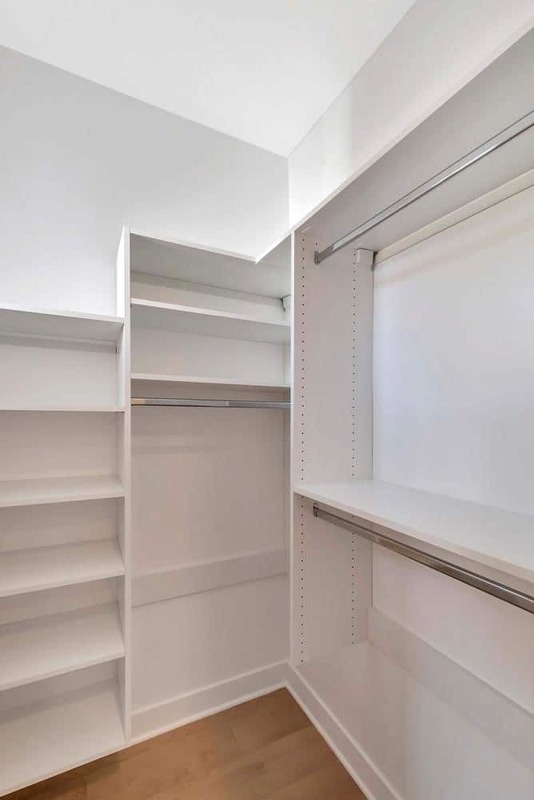 All of the structural components hang off of the rail. 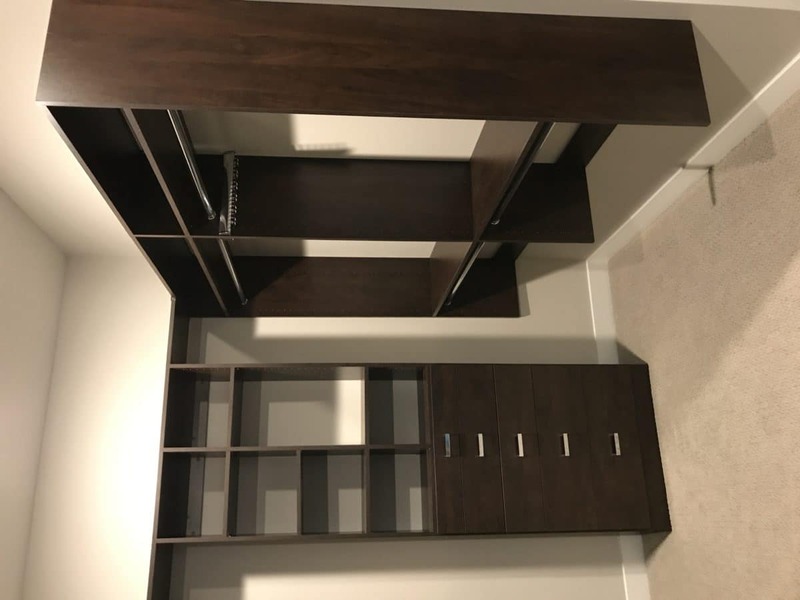 The weight of the system is carried by the studs and is very strong. 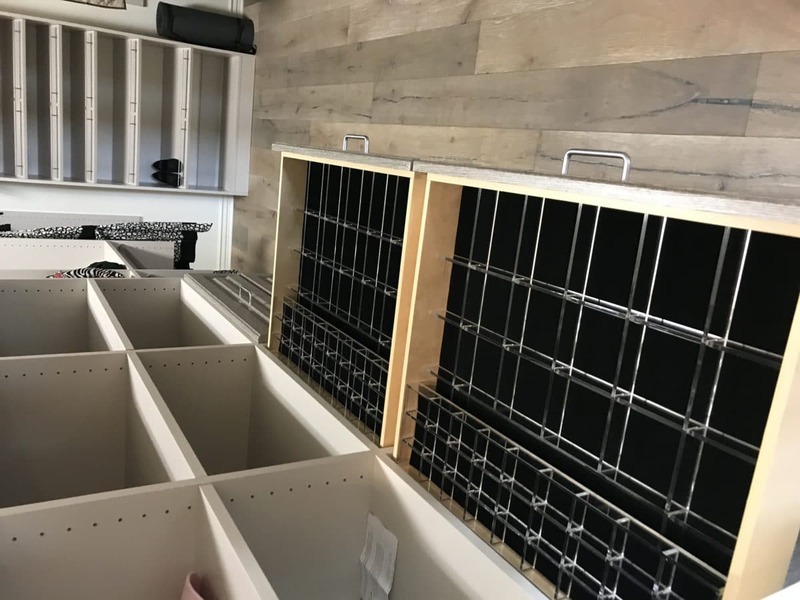 The vertical panels accommodate an engineered wall mounting bracket that attaches to the panel and clips over the rail. 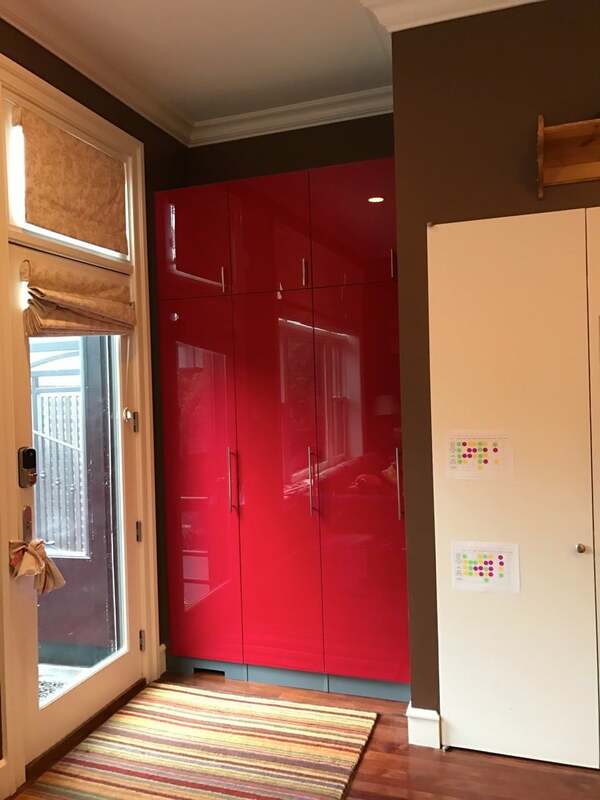 Horizontal and vertical adjustment screws make for a perfectly square result. 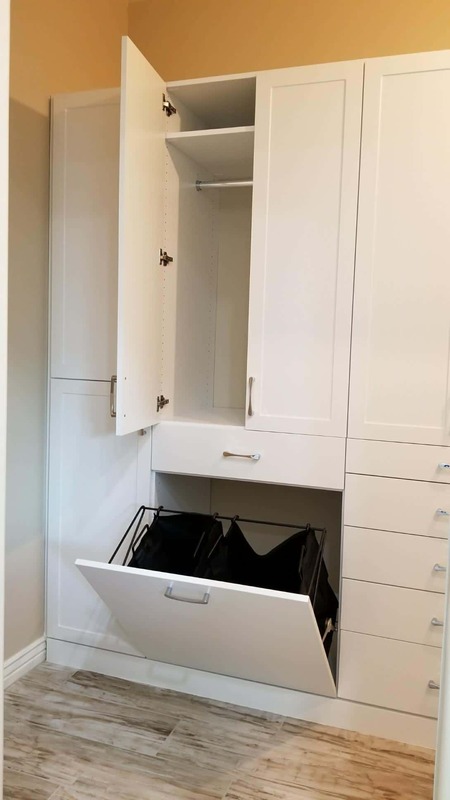 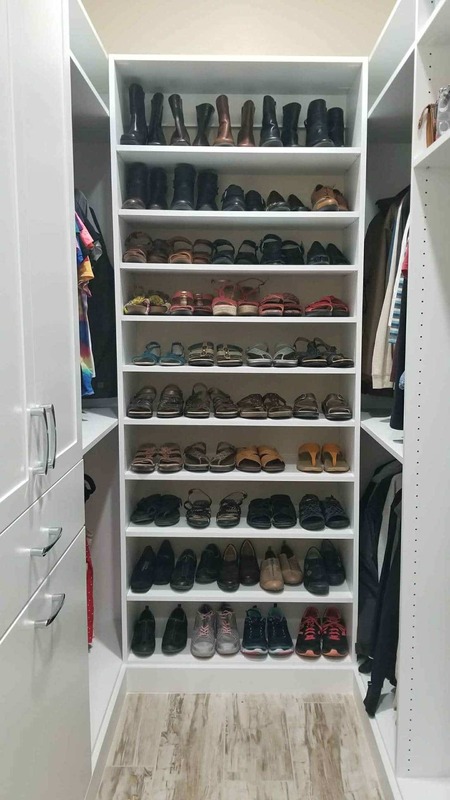 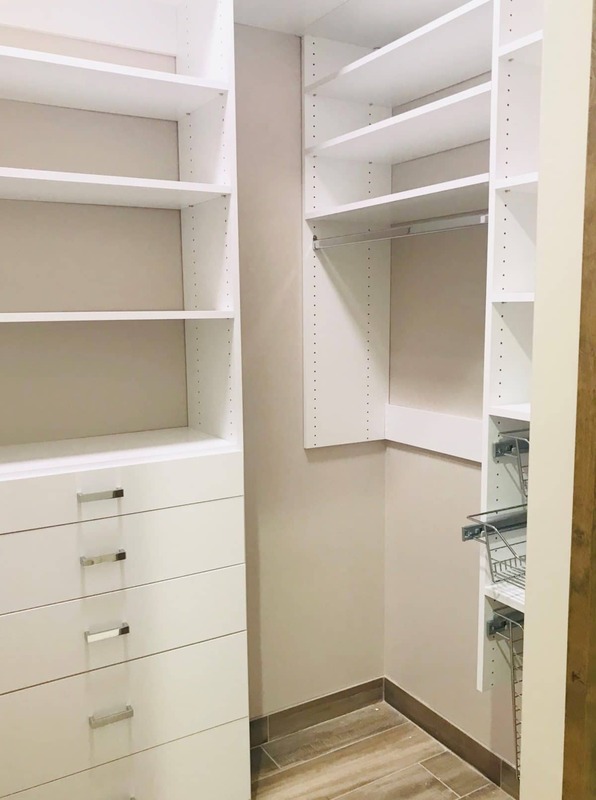 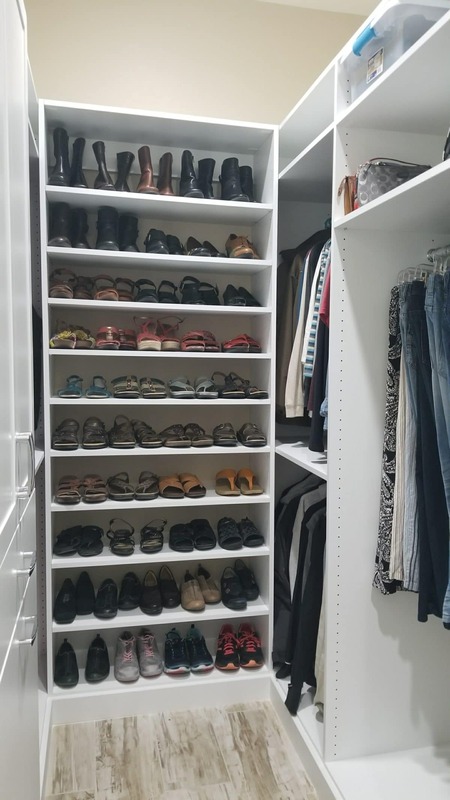 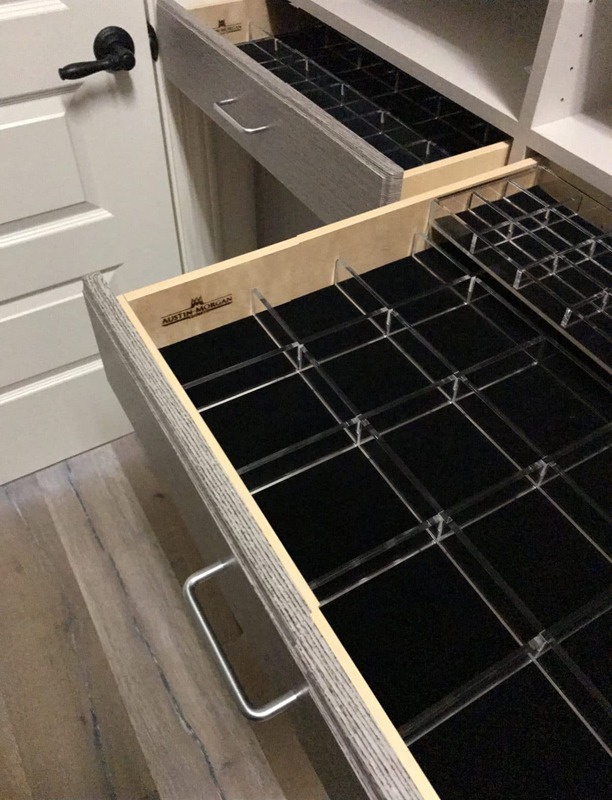 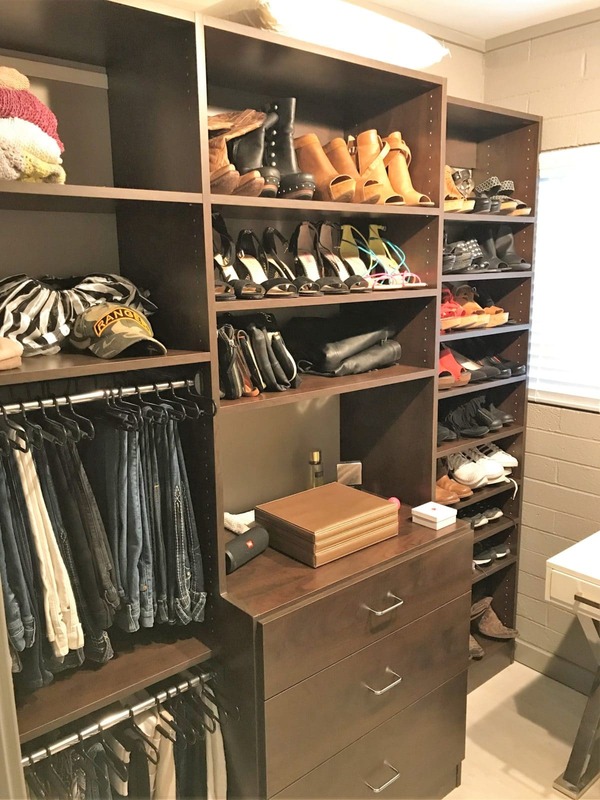 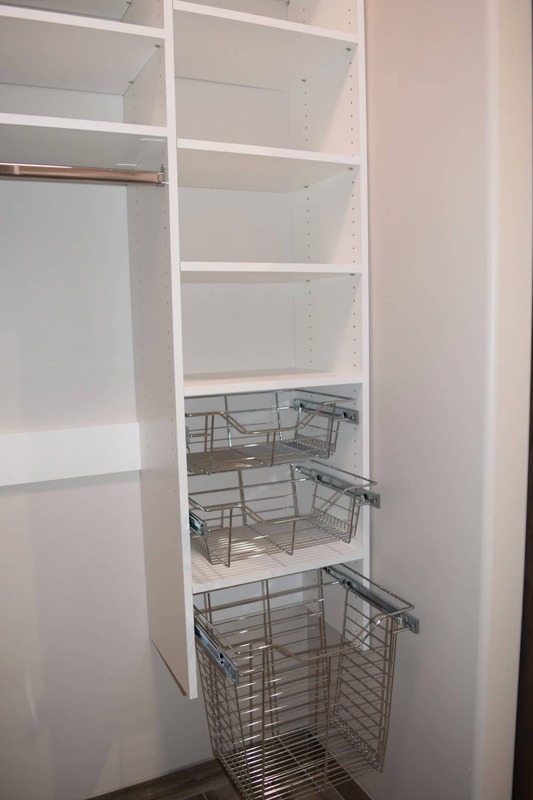 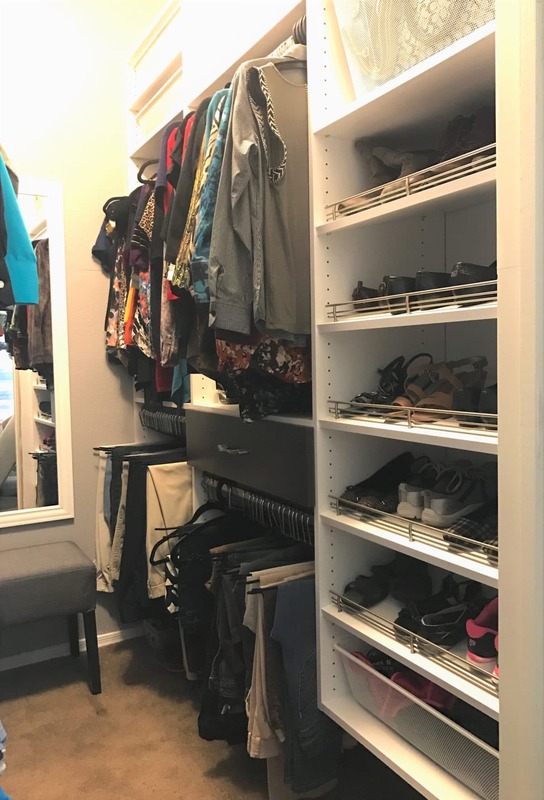 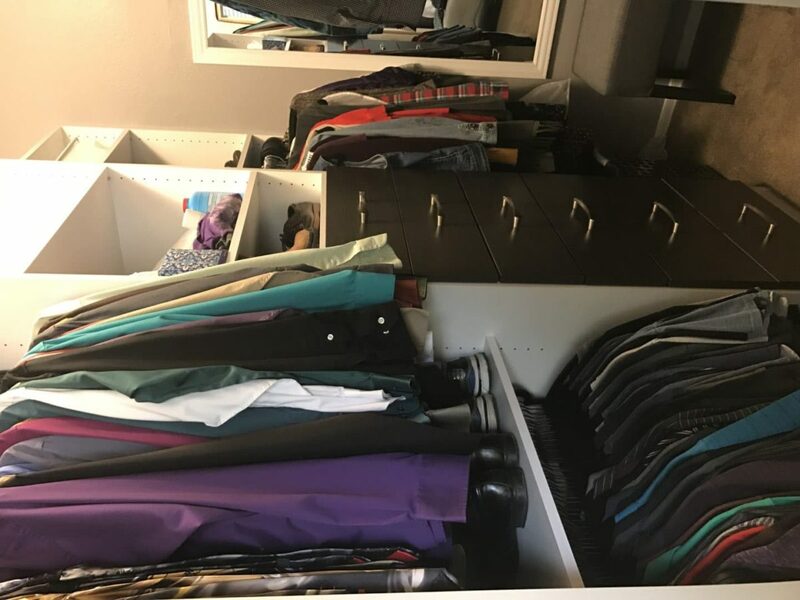 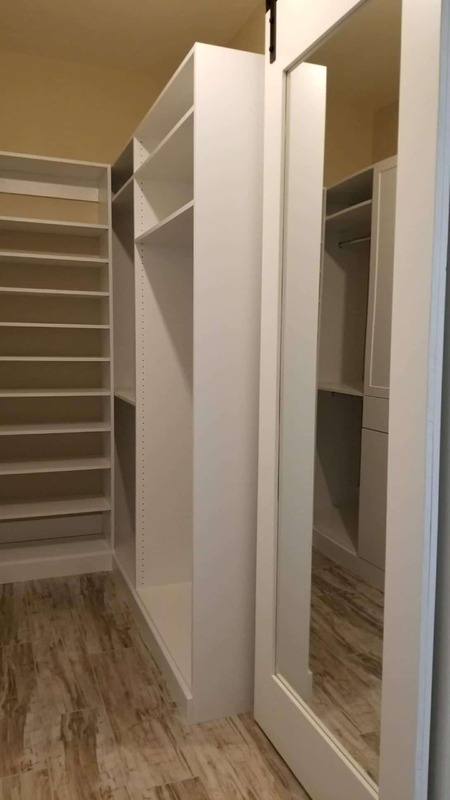 Floor based closet systems are designed to be supported by the floor and include a base cabinet that raises the closet a few inches off the floor. 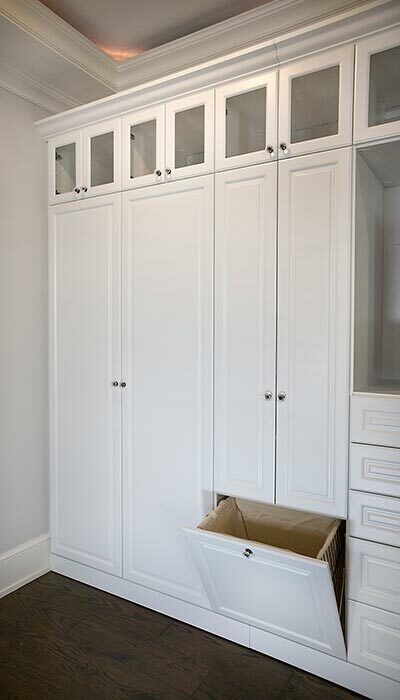 Typically, the bottom of the base box near the wall is cut away and fitted around baseboard moldings to ensure a snug fit to the wall. 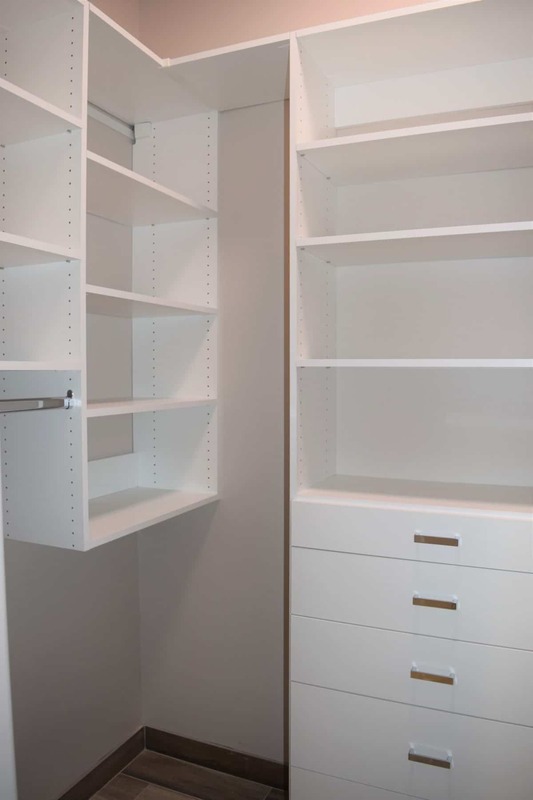 Alternately, moldings like baseboards can be removed prior to installation. 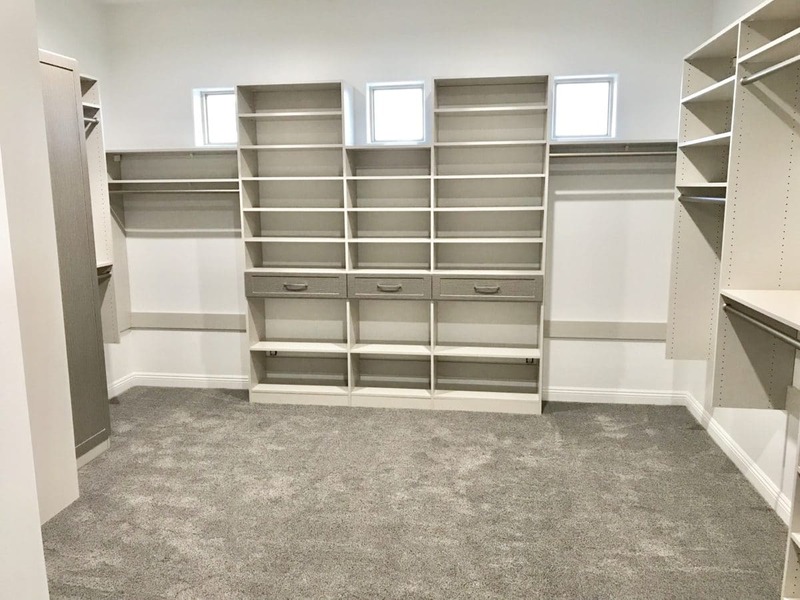 Since floor-based systems sit on the floor, it can be difficult to change the carpeting unless it is removed from under the unit prior to installation. 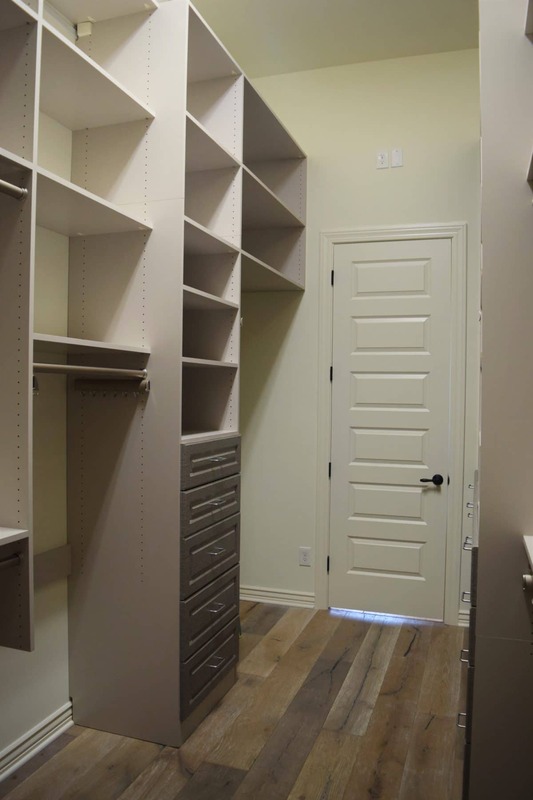 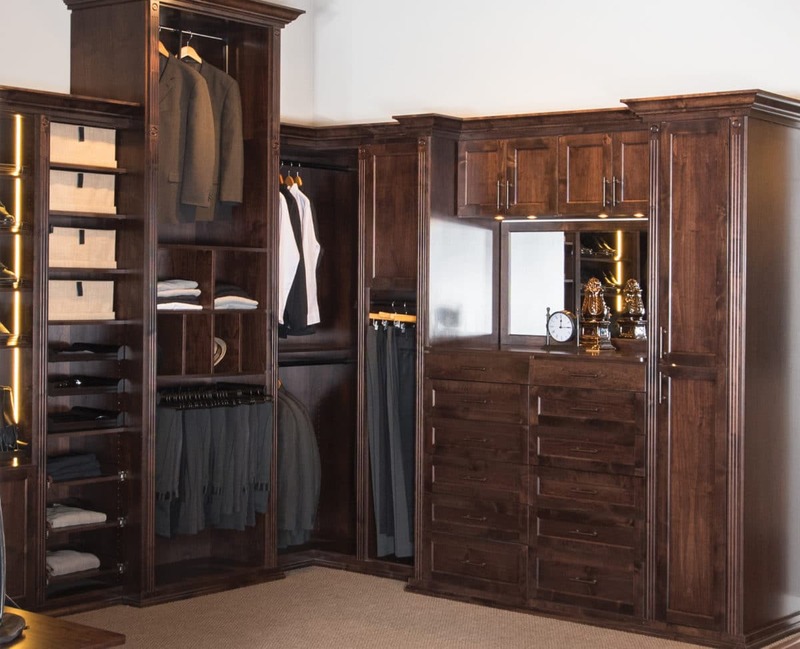 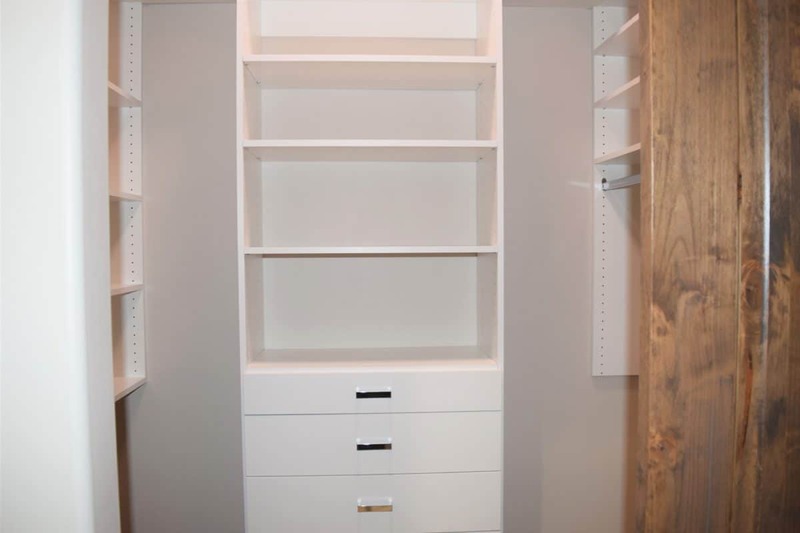 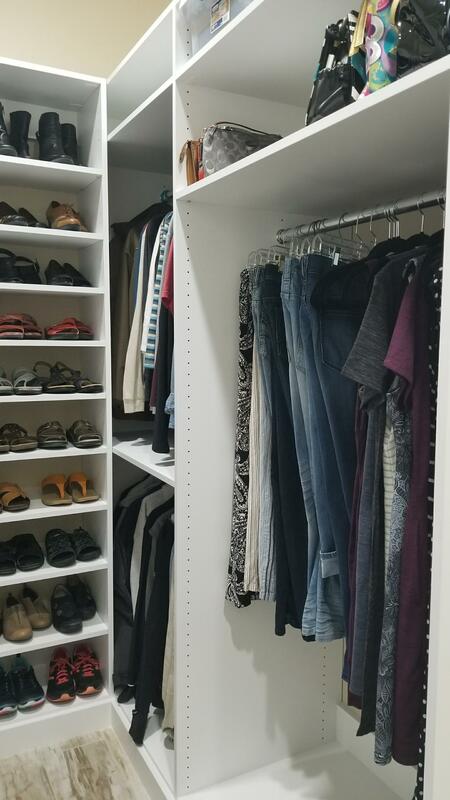 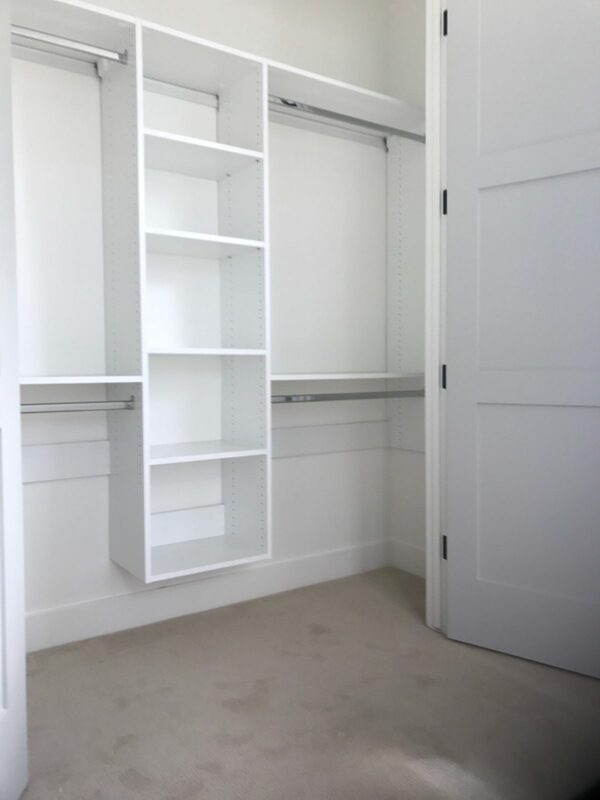 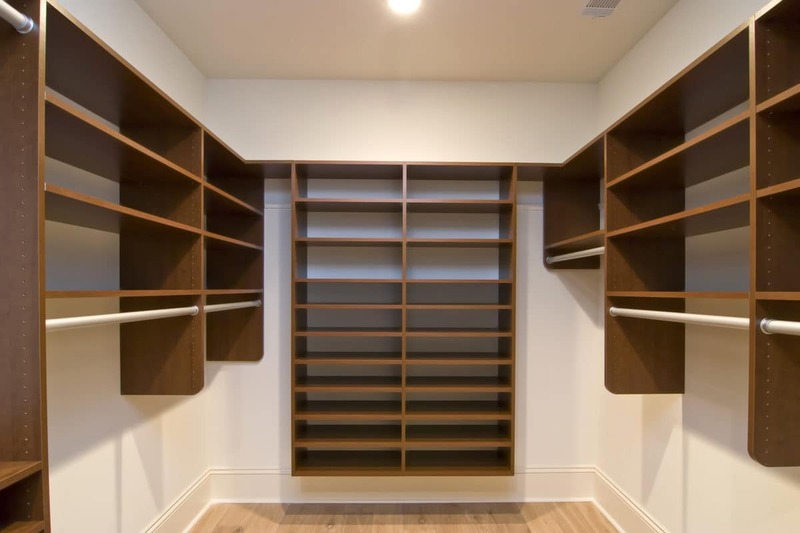 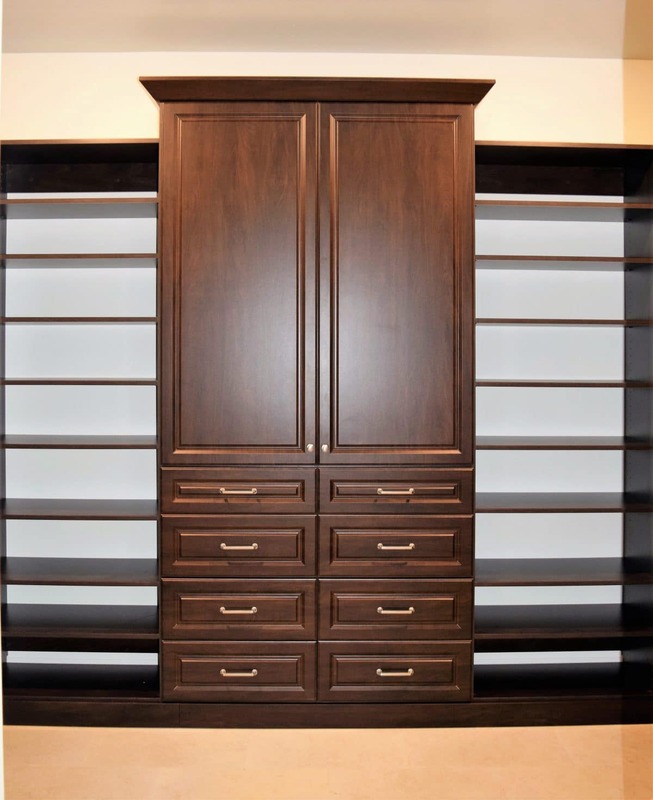 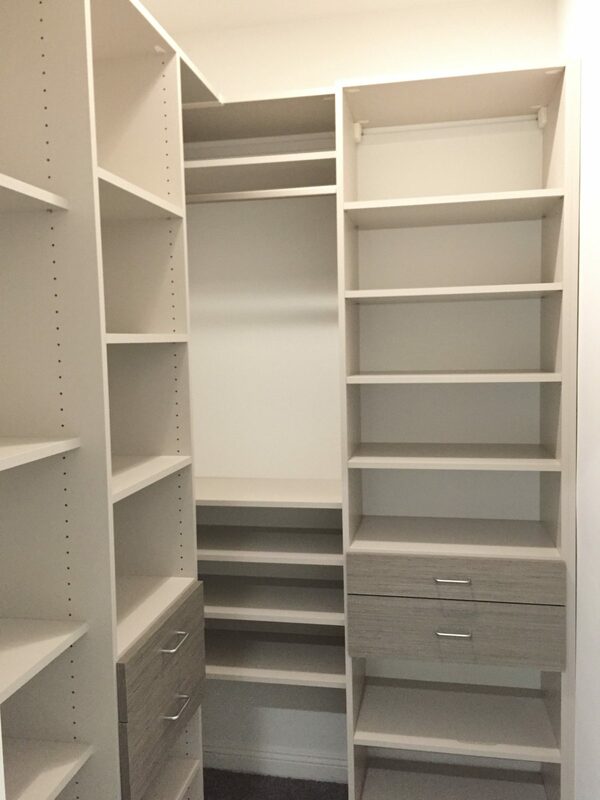 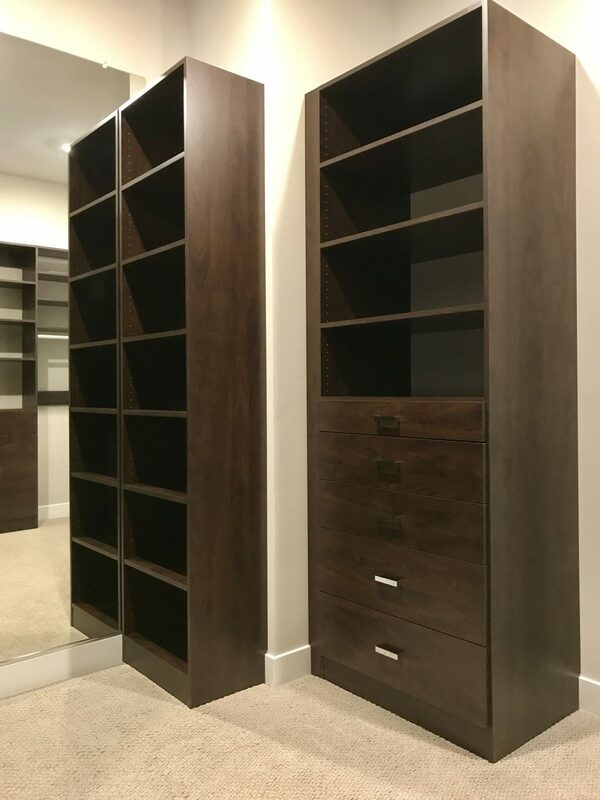 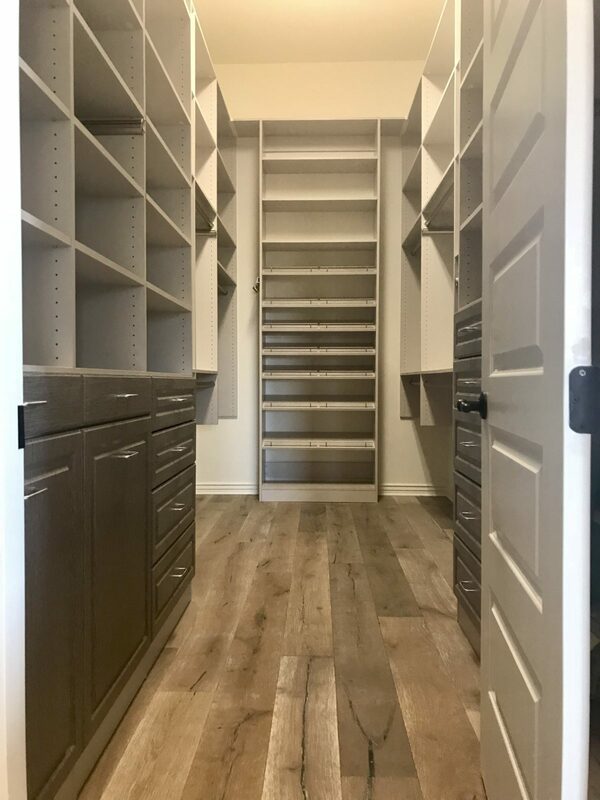 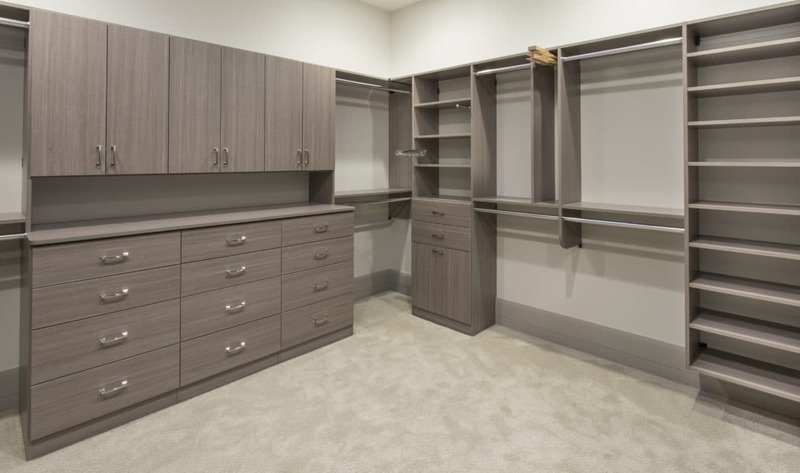 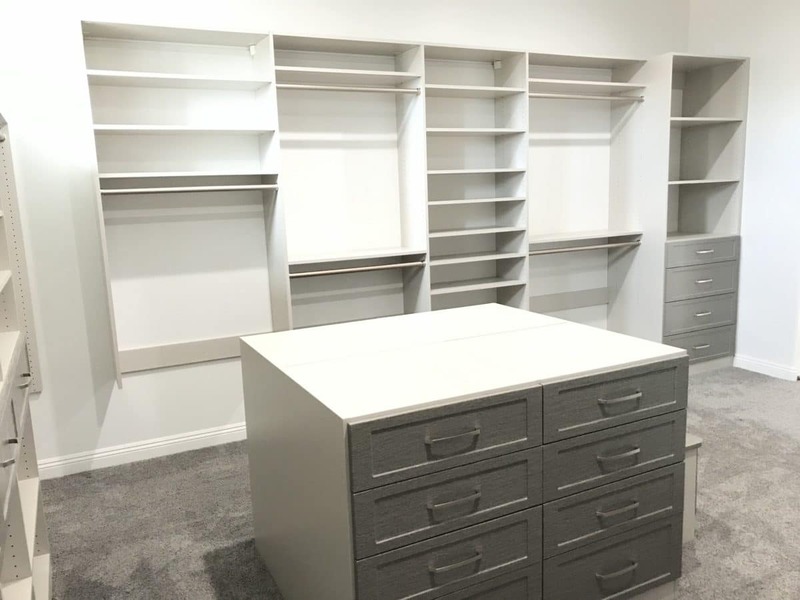 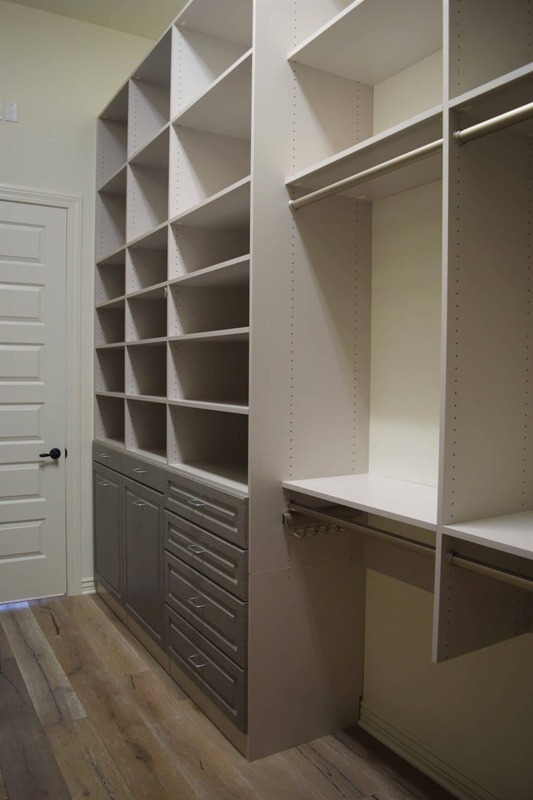 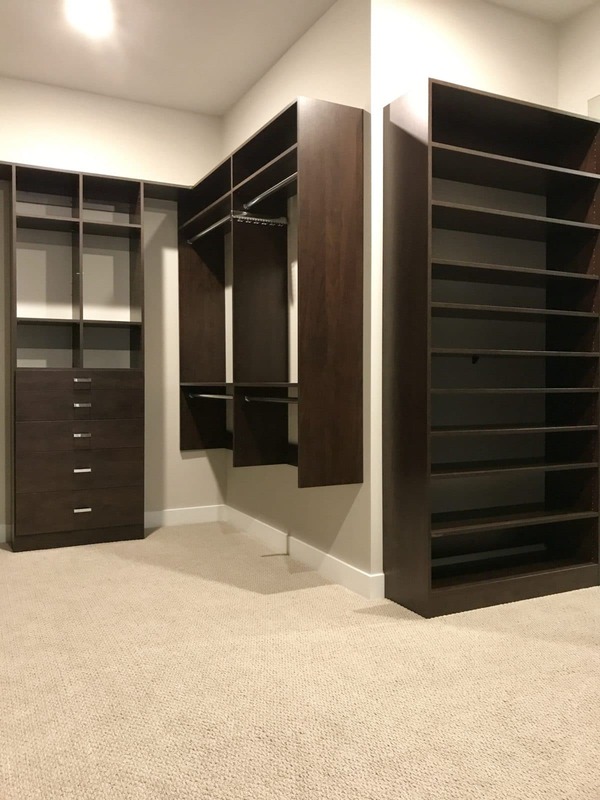 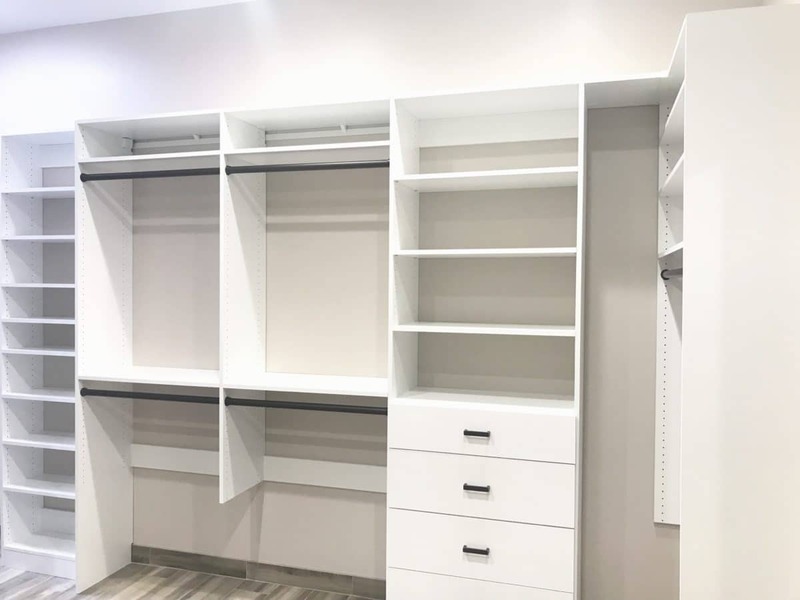 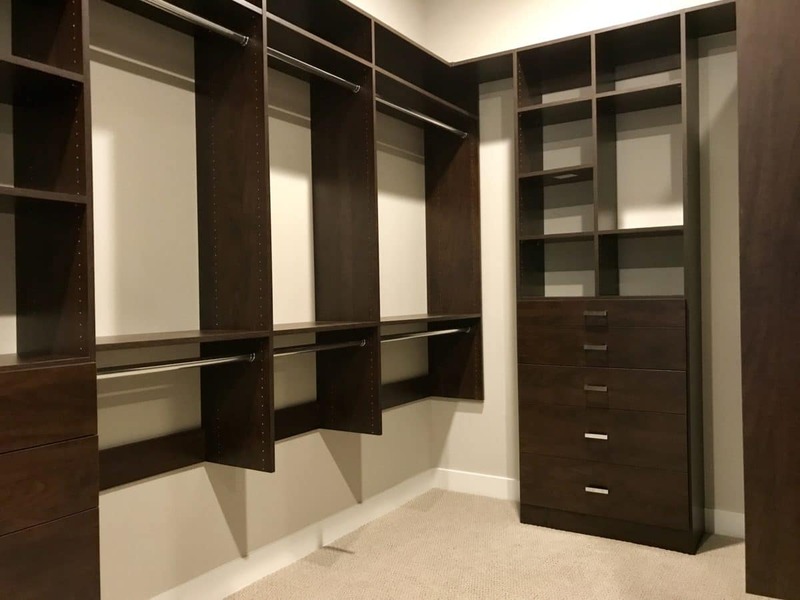 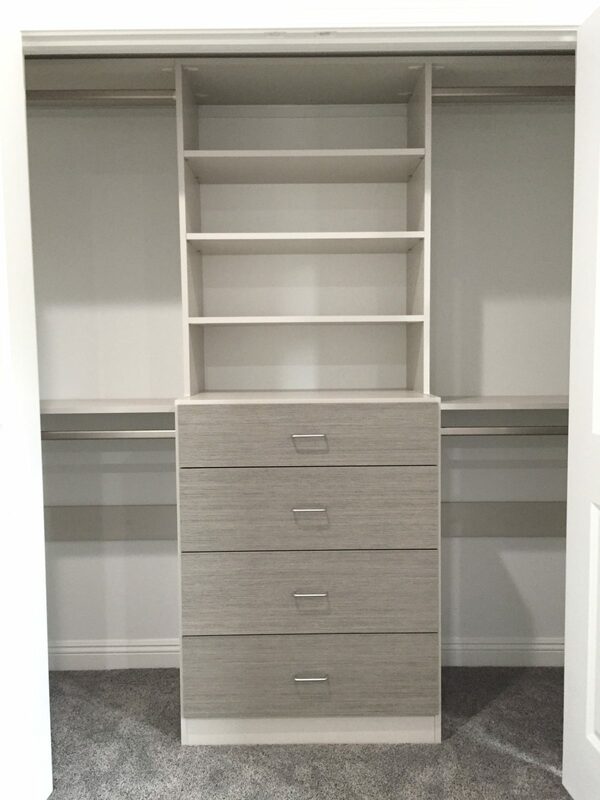 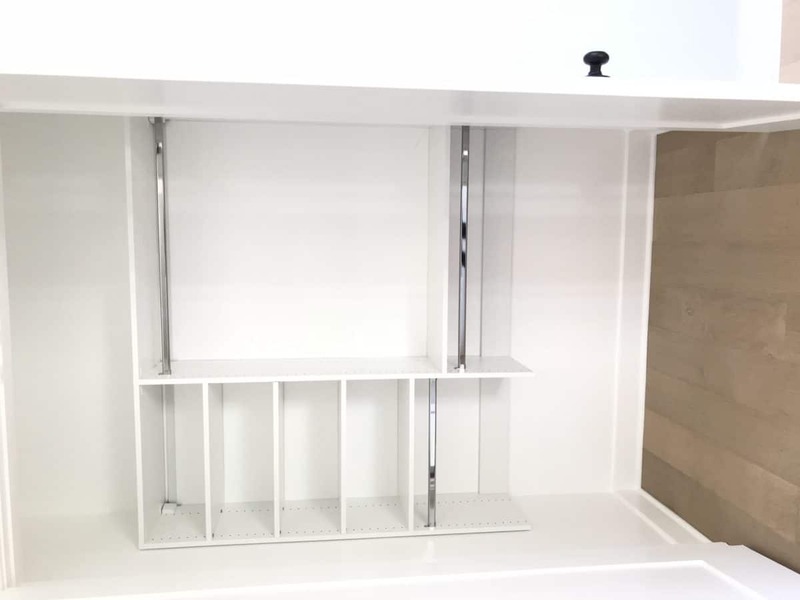 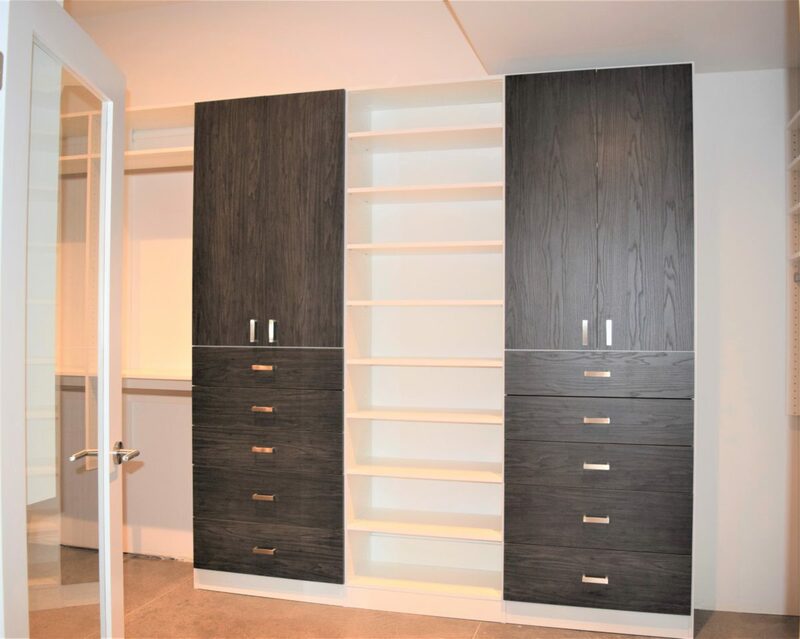 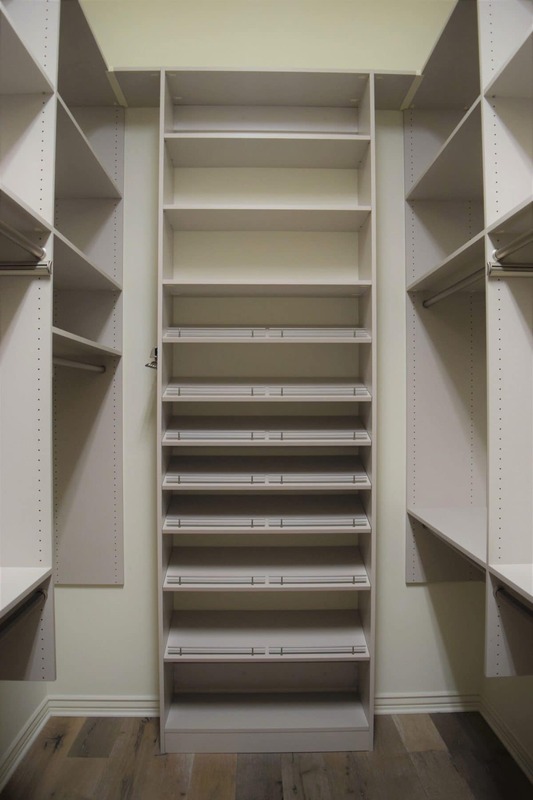 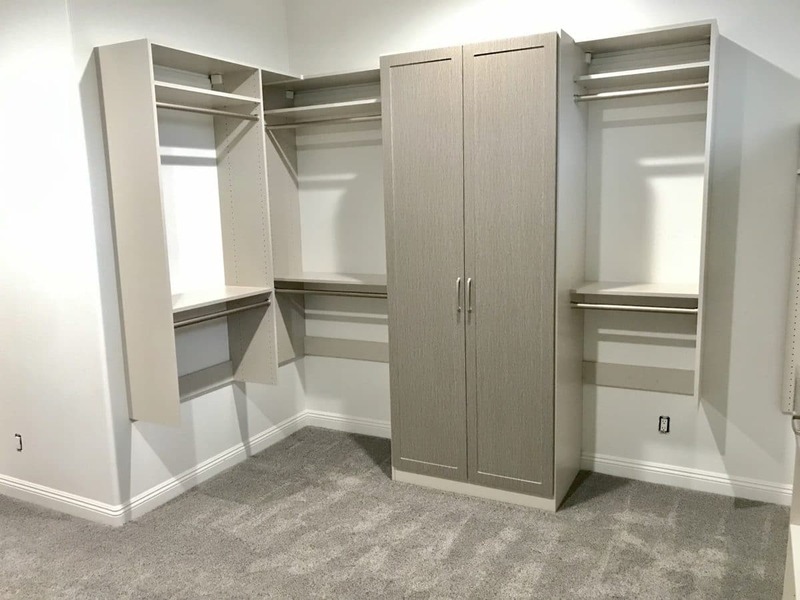 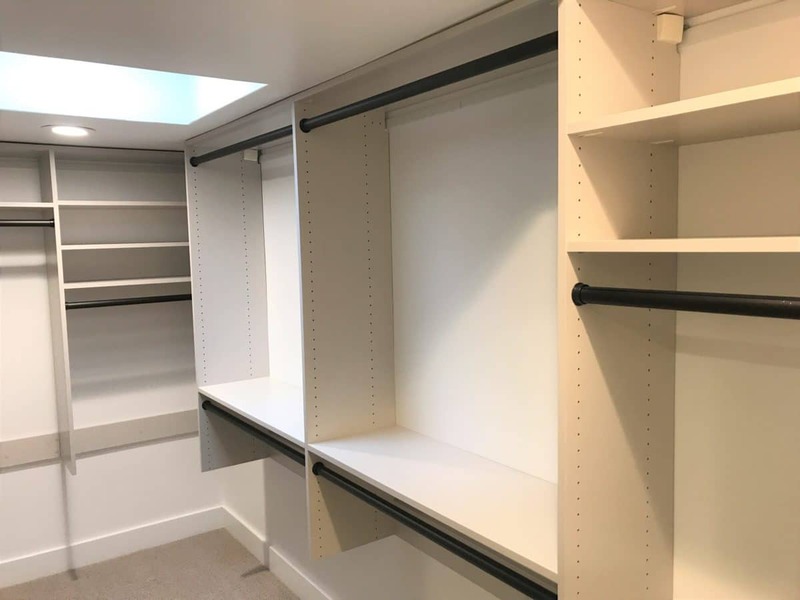 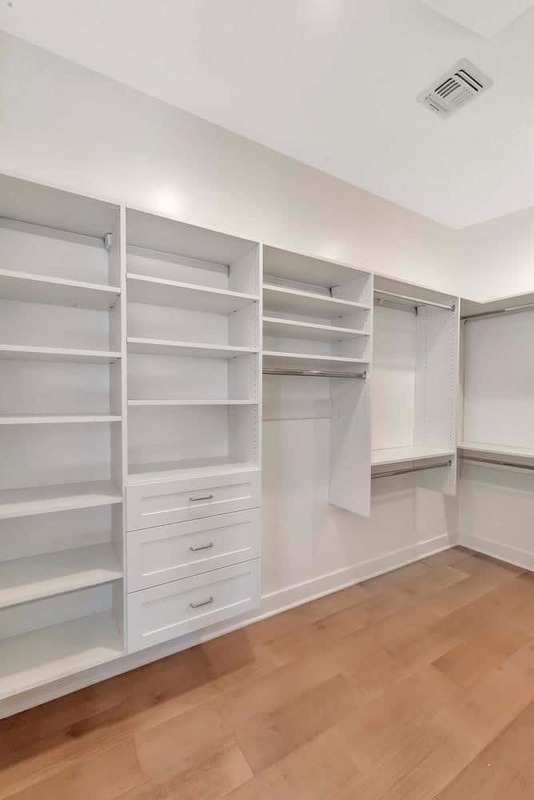 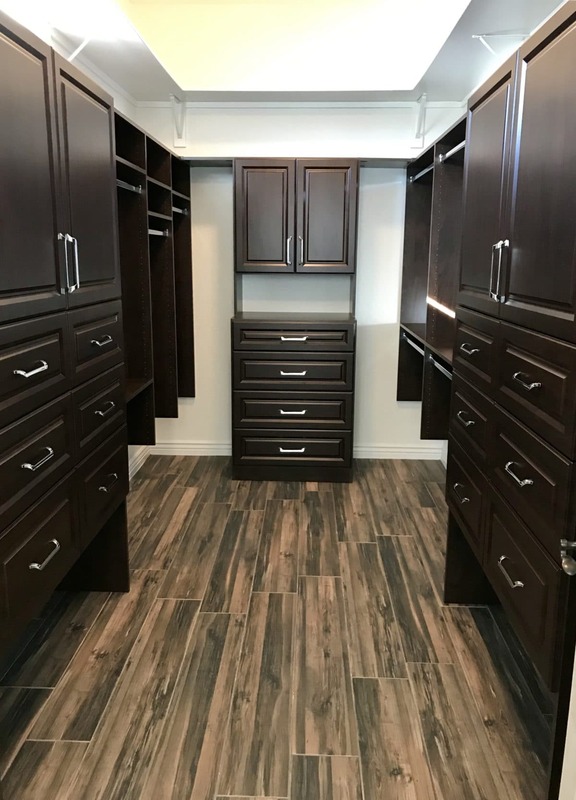 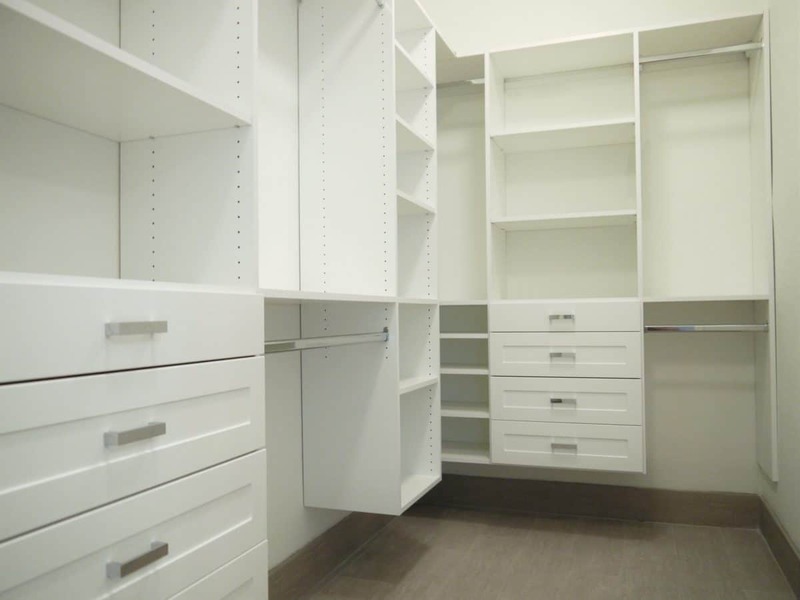 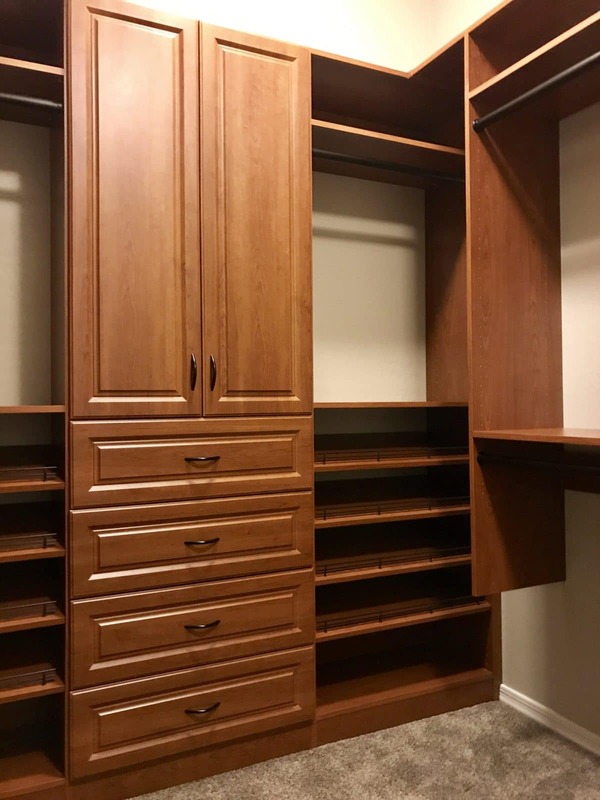 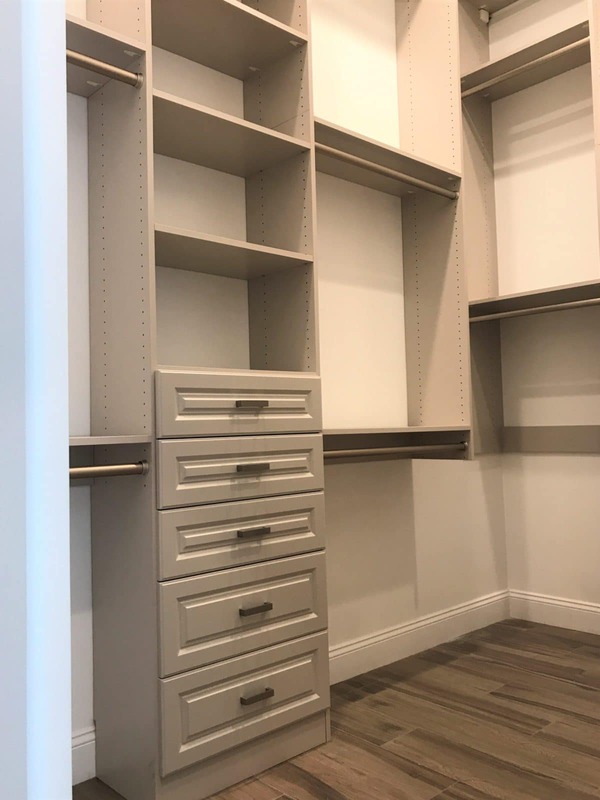 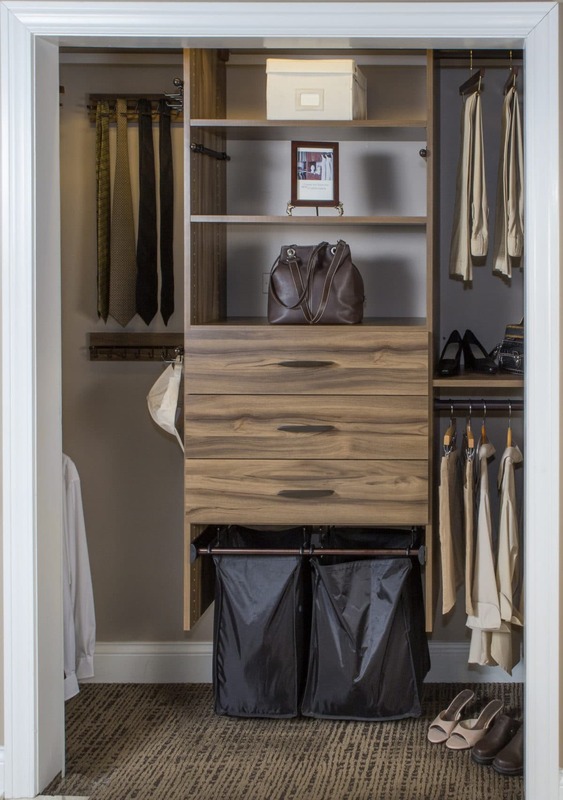 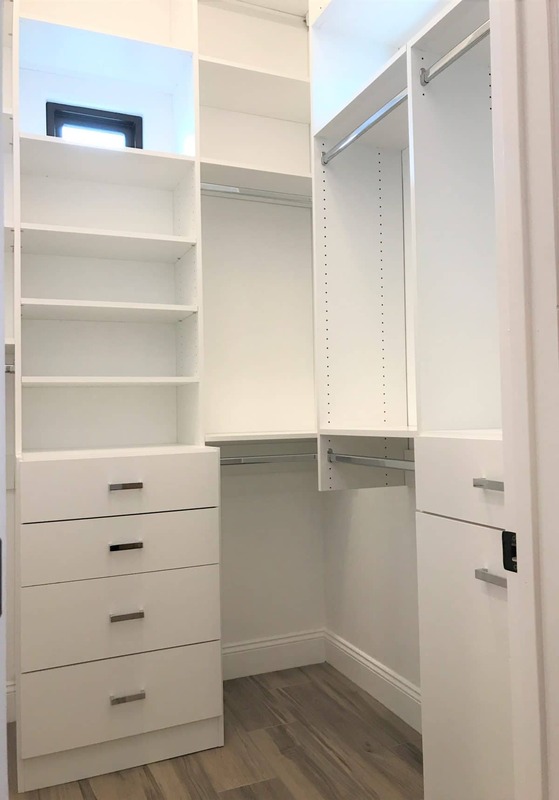 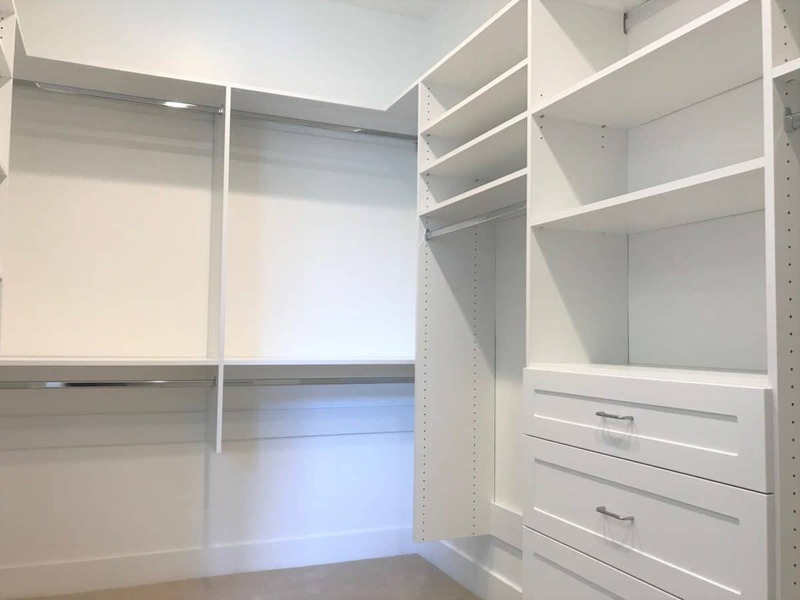 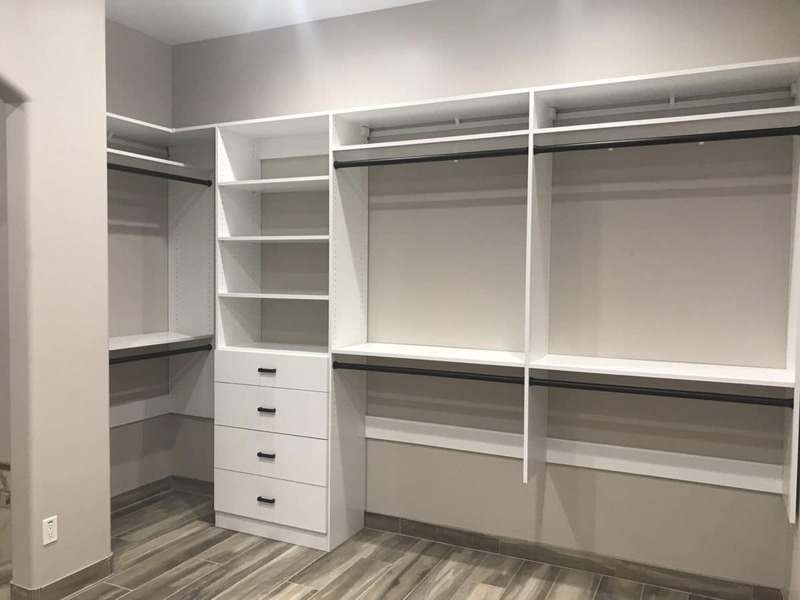 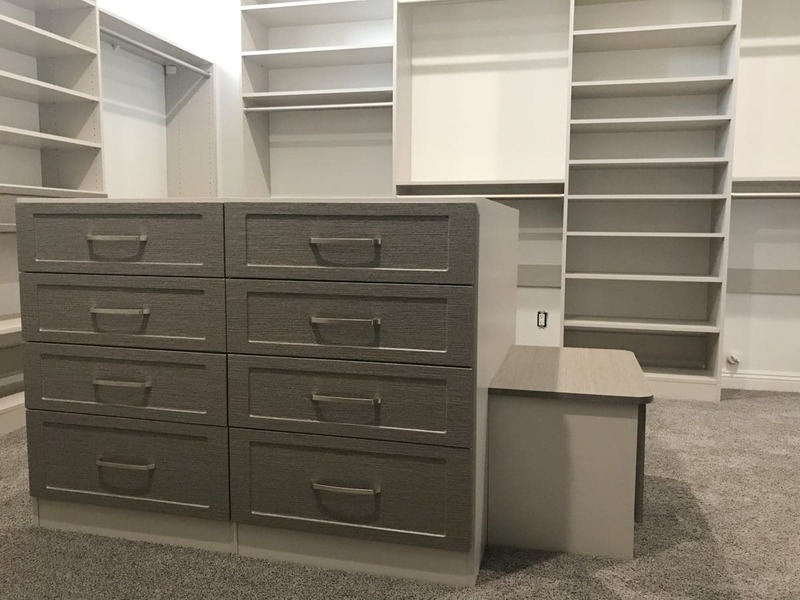 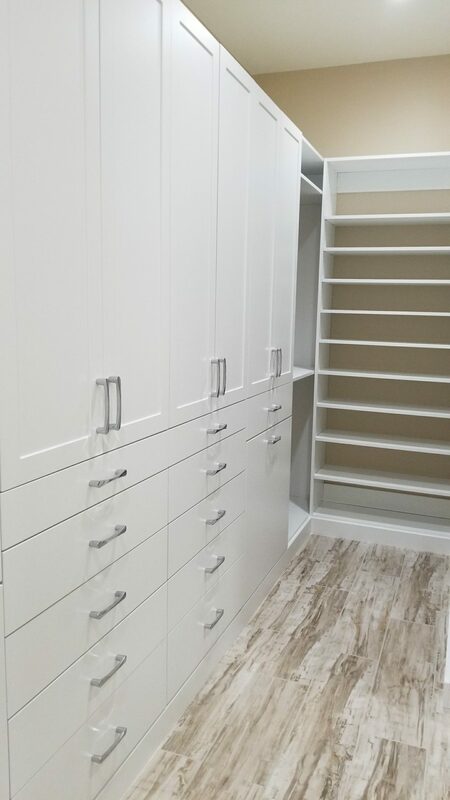 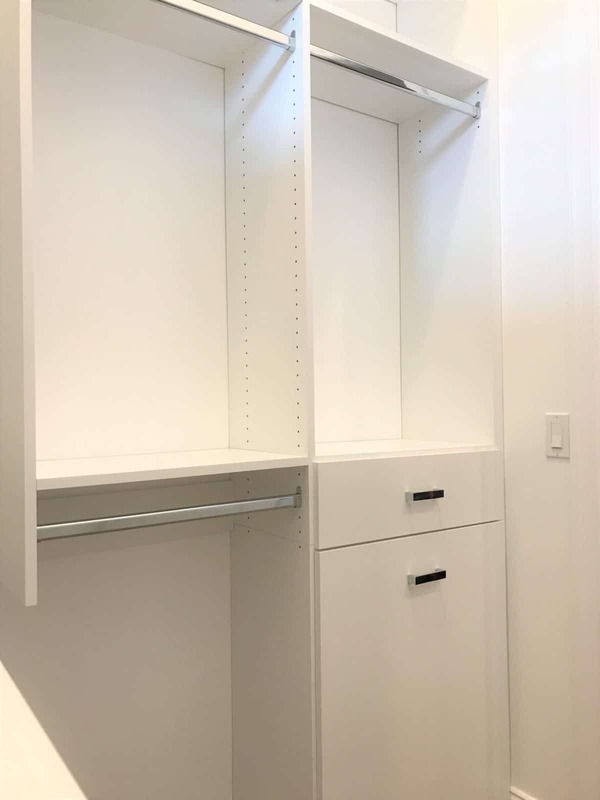 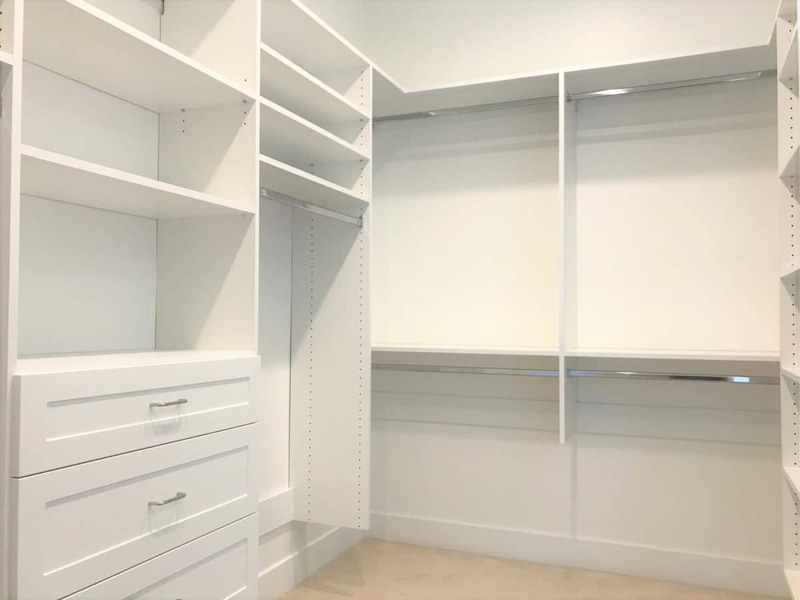 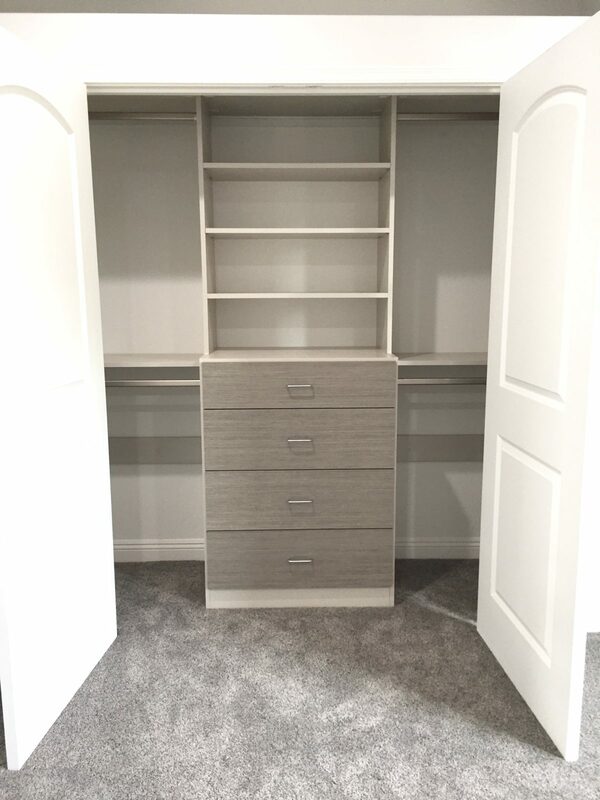 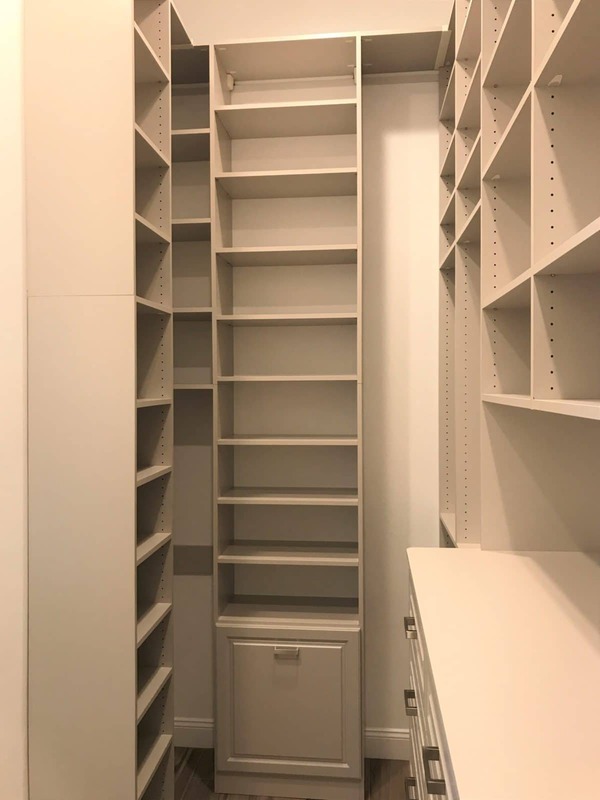 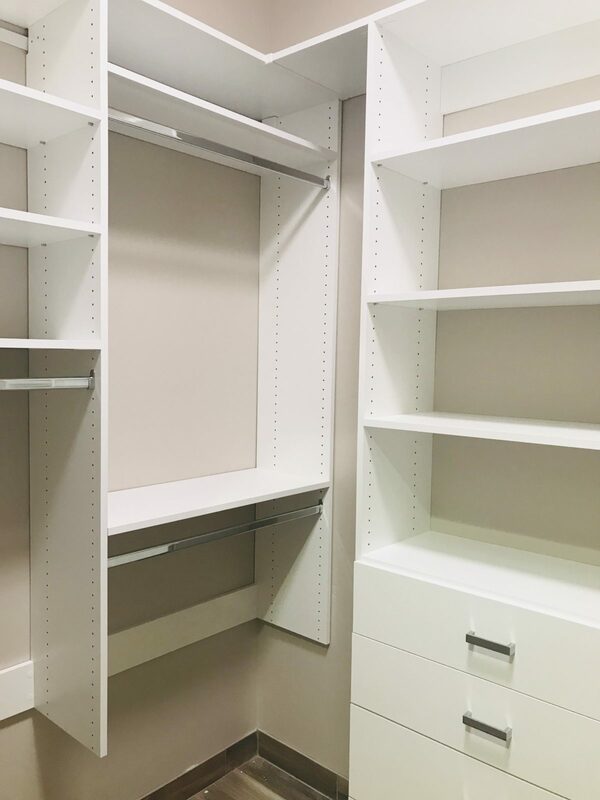 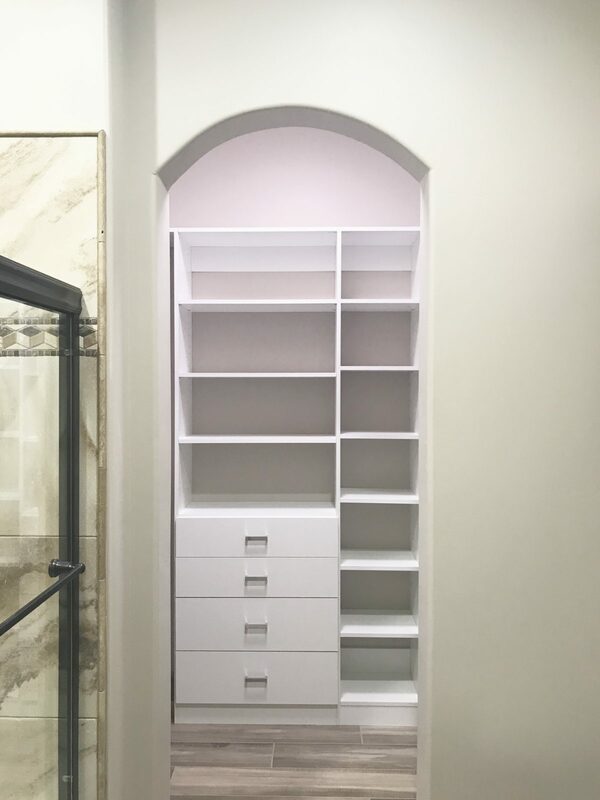 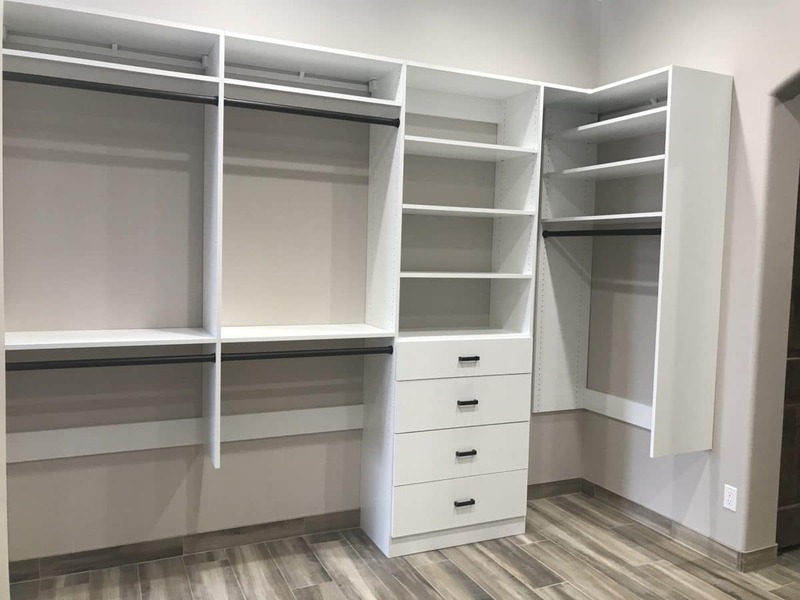 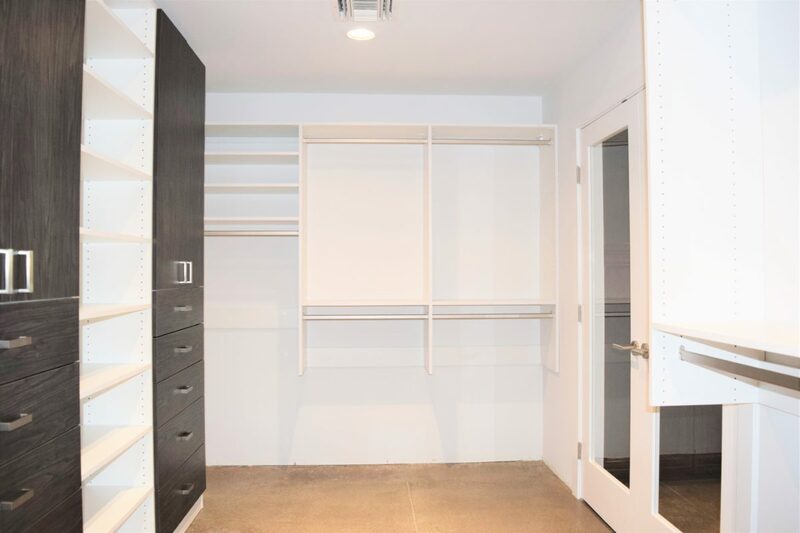 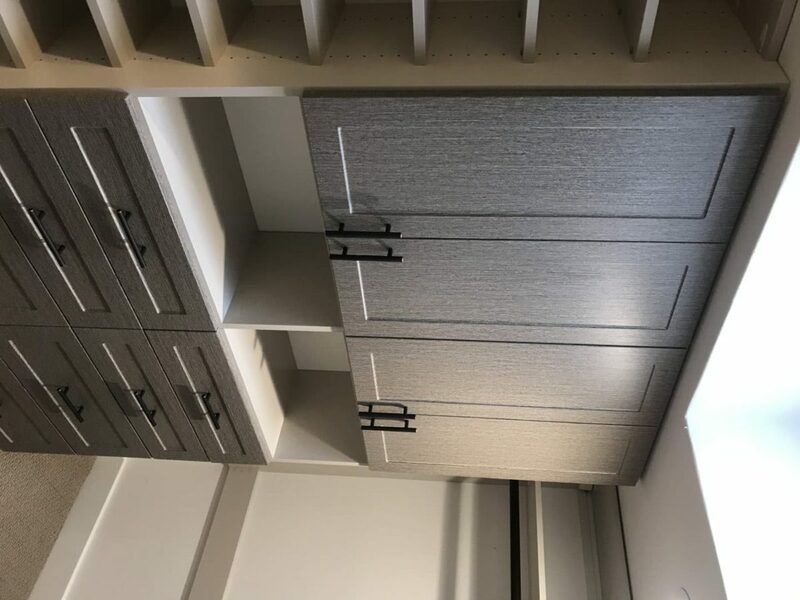 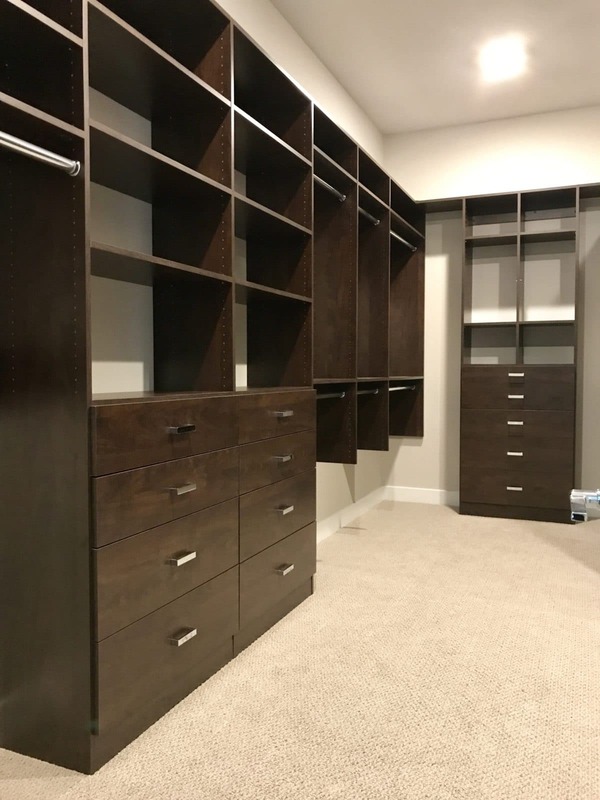 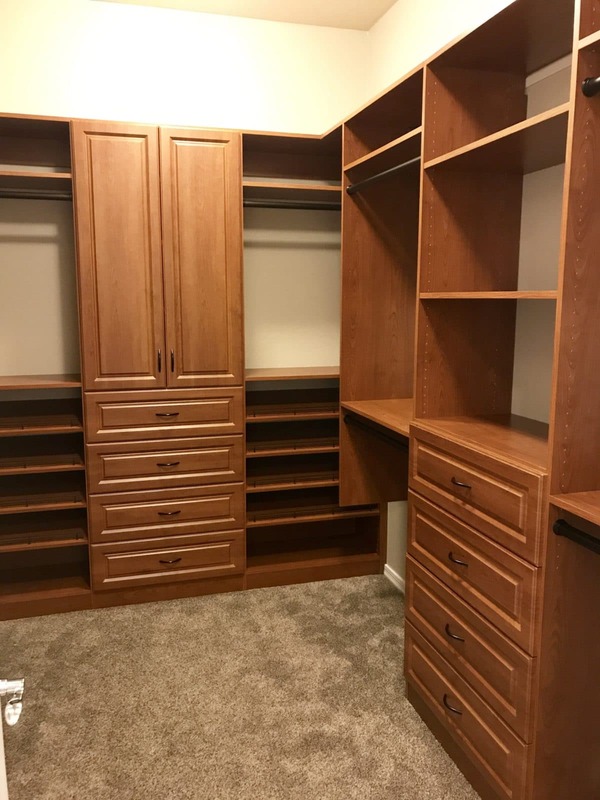 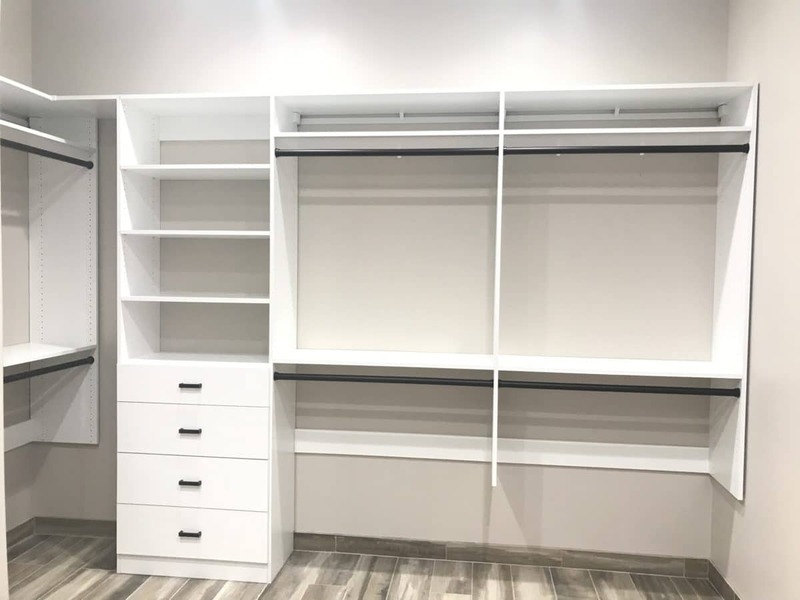 The majority of custom closet systems use a combination of suspended and floor-based pieces to provide the utmost functionality coupled with a beautiful appearance. 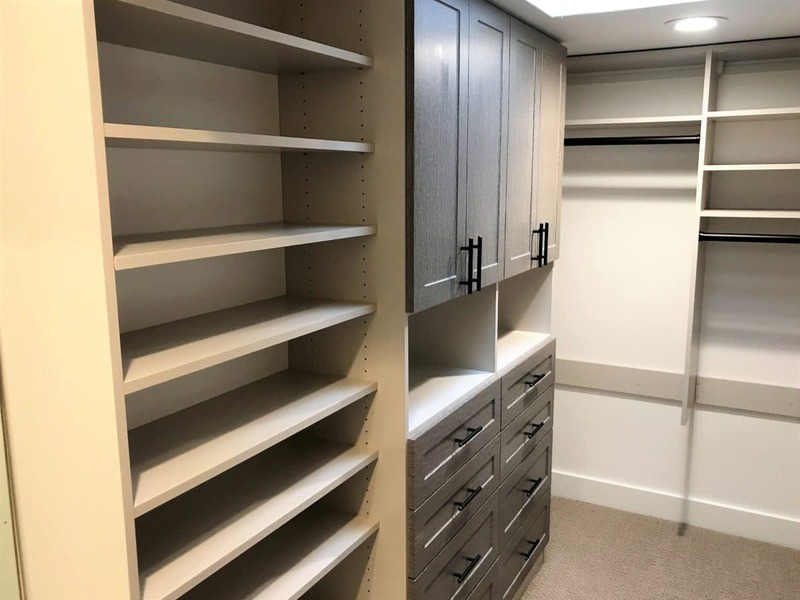 Having both types of storage systems available allows for the creation of optimal design solutions based on the individual needs of each project or room.